Ghotit Real Writer and Reader has just been released as Version 8. It has an expanded floating toolbar with some new features and some functions that have been enhanced. This review builds on my previous review of V7.4 (see second page onwards), so this first part of my review is really an addenda to my review of Ghotit RW&R V7.4. Version 8 has some very handy new additional features as well as some improvements in existing features. 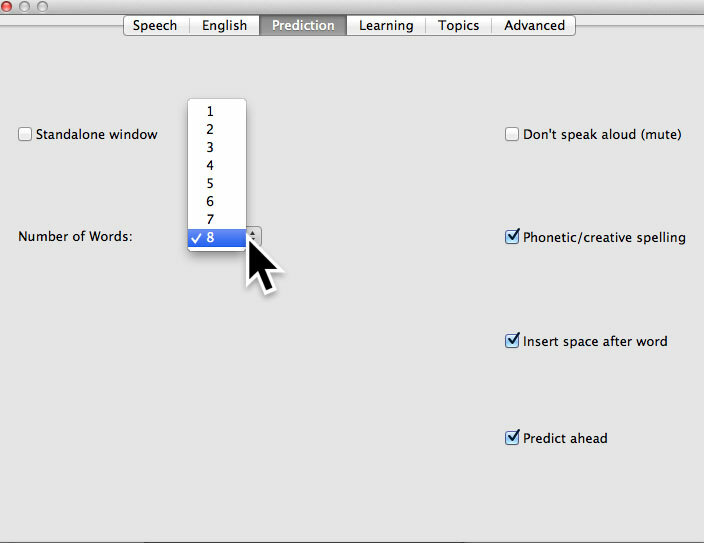 Predict Anywhere – Being able to launch word-prediction is one of the new features from the extended Floating Toolbar. It opens a prediction window that uses can deploy in any application. It behaves very well on MS Windows. On Mac OS it has a few limitations but is still a very useful addition to the program. One quirk on the Mac is where the user must first click the title bar in order to read-aloud prediction options by hovering by mouse. Read Anywhere – This new button reads any selected text without having to copy it. The ability to have text-to-speech is possible on both MS Windows (Narrator) and is native to MAC OS (Apple/System Preferences/Accessibility/Speech). The beauty of having the speak immediately facility is that it is fast and works straightaway with any text in any document, window or web site. Screenshot Reader – This has been totally overhauled and enhanced. It will now recognise text on low-resolution displays such as non-Retina screens as well as many common low-resolution MS Windows screens. It is more accurate and far more reliable. Not only does it read back the text from a locked PDF or photo or screen image (e.g. the rules in a game that re really ‘graphics’ of text) but it also places the text into the Ghotit text window. Settings button – This button brings up immediate access to the Preferences dialogue box and by default shows the Speech option. Users can now change the voice, the rate of speech and both background and text highlight colours with just a few clicks. It is quick and convenient. Or they can change any other of the preferences as deemed fit. Bring Editor to Front – The second last option is simply to bring the Ghotit window “forwards’ or on top of other open windows. This is very especially for users with physical disabilities or for those people using eye-gaze technologies. It avoids the frustration of locating the Apple menu (on the MAC) and using Recent Items and trying to locate the Ghotit RW&W program window. It proves to be very useful to get to focus the Real Writer window if it is concealed or minimized. Minimize/Maximize button – This is used to minimize the Floating Toolbar when not in use. It toggles the floating toolbar to it’s full extent (that of eight options) to just the one green Ghotit icon and back again. The program is maturing and with every new upgrade, it is introducing more features to assist struggling writers and readers and proofreaders. Ghotit RW&R is a standalone software program, available for MS Windows, Chromebooks and MAC OS computers. Once installed, it does not require further Internet access. Users can work with Ghotit RW&R with any preferred word processor or text entry tool, website or program. With younger students, it can be used as the user’s main word processor, if required. Text can be copied from programs such as Google Docs, Pages, OneNote, Inspiration, or MS Word by using copy/paste or by selecting up to 1000 words and pressing Fn-F6 keys or by using the ABC button of the Floating Toolbar. Ghotit Real Writer & Reader 7.4 is an integrated writing and reading software program. It cleverly combines several advanced inclusive technologies specifically created and designed for people with dyslexia, dysgraphia and other learning disabilities and difficulties. It also can be applicable to users learning English as a second language. Ghotit is useful and relevant for children at home or in school. It also caters to adults with dyslexia and dysgraphia and allows them to read, write and correct text in any application – independently. Therefore, it empowers children through to adults to confidently work with text for writing, study or research purposes, or just for fun. It builds skills, confidence and the ability to accurately create or edit their own work or in third party documents. Screenshot Reader that is able to read text within images or photos, locked PDF files, etc. Ghotit’s patented Text Correction technology provides the most accurate fixes for spelling, grammar and punctuation mistakes according to the intended meaning of a text. This is not unique as there are competing products with similar claims but it performs these functions with an extremely high degree of accuracy, speed and efficiency. In addition, it is very easy to learn, use and master. The program’s software corrects text analyzing the components and structure of the sentence that the user is typing. Ghotit Quick Spell Word-Prediction is a state-of-art technology designed for writers with typing issues and for phonetic or ‘creative writers’. It also caters to students with physical disabilities, as words do not have to be fully completed. The user may employ the use of a conventional keyboard, enlarged or programmable external keyboard, onscreen or ‘virtual’ keyboard or eye gaze technology. Words are predicted in a list with accompanying Function key shortcuts by using just a few initial characters. The user can select a long or complex word quickly and efficiently, knowing that it is spelt correctly. Word Prediction technology increases writing speed for many users who have great difficulty in attempting to type text and spell words. Ghotit successfully predicts intended words with instant correction of the first misspelled letters. It has powerful algorithms that check the context of the word in the sentence and displays a list of intended words, all with associated meanings. Users can elect to have each meaning read aloud or ‘spoken’. The student or writer may require text-to-speech support, as they may also be poor or struggling readers. The male or female voices are human quality and the users can alter the rate (or speed) of speech to suit his or her preference or cater to the genre of text. The user, of any age and ability, can choose familiar text to be spoken aloud through speakers or a headset/headphones/earplugs at a fast rate whilst difficult, complex or new text might be read back more slowly. Ghotit Reading Technology makes any text document readable: users of all ages can hear text being read aloud in conjunction with dual colour highlighting, using a preferred voice (male or female) and at a specific rate (or speed). The user, parent or assistant can change voices and rate of speech at any time. I particularly like the Ghotit Screenshot Reader feature that reads texts taken from images, photos, graphics, games, locked PDF files and other inaccessible documents or web pages. It will capture any text on screen and read it back to the user. Users can copy and paste the required text into other documents, or save it to the user’s Google Drive or Dropbox. Reading text aloud works in place on the screen with yellow highlighting of the currently read word and this can be repeated. In parallel to reading, a copy of the recognized text is available for users from the Ghotit Writer window and could be further copied and pasted into another program. Ghotit Real Writer & Reader integrates with most common Mac OS applications (i.e. Pages, Microsoft Office, OneNote, Safari, Chrome, Gmail, Google Docs/Drive) for text correction and for reading text aloud. English is a complex and difficult language to learn and master. As it has evolved over the centuries, it has many spelling irregularities and grammar rules, many of which are inconsistent and confuse students and adults alike. Standard spell checkers don’t usually cope with users who begin words by approximating the ‘sound’ by using usual combinations of letters. Some students find phonics difficult to master. Many people make spelling and grammar errors that regular spell checkers in other programs that cannot correct. Ghotit is the only spelling and grammar checker that corrects severe spelling and problematic grammar errors. The beauty is that it does it with ease and without an Internet connection. It is fully stand-alone. It has an intuitive interface and only four major buttons on screen. It provides a floating toolbar that used independently of the program and performs text-to-speech, reading back text and a screen shot reader. Original Text: That whas scery. I can fell a shiver down may spiyn. Its getting liyt. I shud go to bed. I bet im gooing to have nitmers a bawt that. o well, just have to dellwith it. I cant get that thim song out ove my haed never going to whach halloween movie a gen or its seqwels. Corrected Text: That was scary. I can feel a shiver down my spine. It’s getting late. I should go to bed. I bet I’m going to have nightmares about that. Oh well, just have to deal with it. I can’t get that theme song out of my head never going to watch Halloween movie again or its sequels. The program uses highly developed algorithms to determine the spelling, grammar and punctuation errors in a sentence. The user can select from a number of English based dictionaries including Australian, United Kingdom, New Zealand, Canadian, United States and South African. By selecting or highlighting a word, phrase sentence or the entire text (e.g. Command-A or Ctrl-A on a Windows computer) the user can choose the ABC tick icon displayed on the left hand side of the screen. Ghotit software will analyse the text for errors and mistakes as well as missed words and incorrect punctuation. The above example above clearly shows how these errors are all highlighted in different colours. Users may elect to write straight into the Ghotit window or cut and paste from third party text (e.g. an MS Word document or Google Doc, PDF, web site or note from Sonocent Audio NoteTaker). 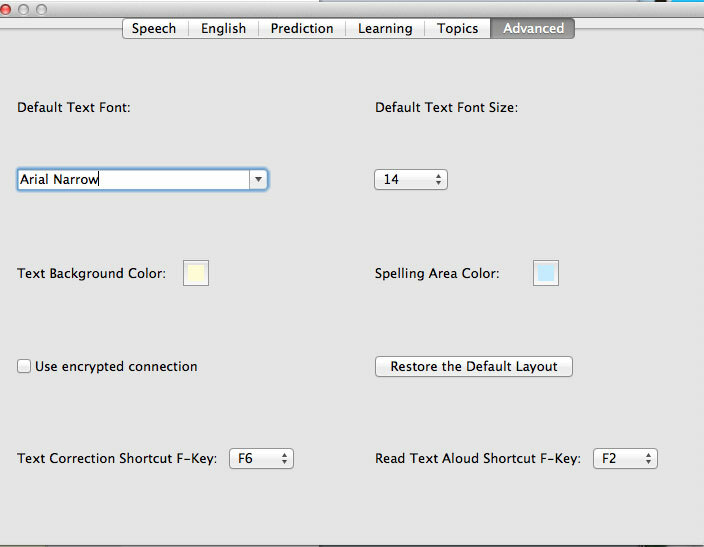 They might elect to highlight text from another source and use Fn-F6 to transfer the text into Ghotit as another option. 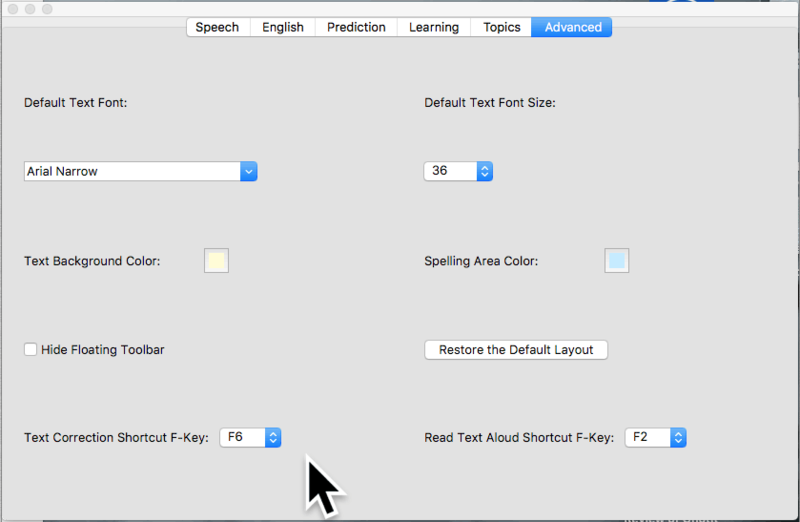 The user can elect to press Fn-F2 keys to hear text spoken aloud with dual highlighting. Yet another option is to use the Reading button of the Floating Toolbar. The software will clearly mark misspelled words, suspected confused words and grammar errors by the colours red, blue and green respectively. The user then simply clicks on an incorrect word. The software will offer alternate word suggestions. To approve and apply the selected changes, the user clicks on the Smiley Tick button. This will remove all colouring and markings in the document. The program uses the system voice from the user’s Mac OS computer. The user selects a voice from a drop down menu and then sets the rate of speech (from slow delivery to fast). Speech feedback can be turned on so that everything the writer types will be spoken back after a spacebar hit (and the entire sentence spoken after a full stop, exclamation mark or question mark). Colours can be judiciously used to help users who have Meares-Irlen Syndrome by having the selected word in one colour (e.g. light pink) and the background in a darker colour (e.g. dark purple). This affliction occurs with many students and is often undiagnosed or misdiagnosed. Note: Mac OS is packaged with a number of high quality voices. In order to download and experiment with a wider range of voices, or when using different languages, go to this site for many more English voices and other languages (e.g. Heather in Scotland). To have text read aloud, the user highlights some text from the Ghotit window and clicks into the Speaker icon (top left of screen). The text is spoken with foreground and background highlighting. Clicking the speaker again will stop or pause the speech feedback. Therefore speech can be toggled on and off at will. Users can work with any word processor or web browser (off line or online as with Google Docs) and copy/paste text to be corrected in Ghotit’s window. In addition or alternatively, Ghotit can be used simply as a text editor (with all of the wonderful access options available). The icons above appear in a horizontal toolbar in the program. The user can elect to create a new blank file and start from scratch or later cut and paste text from other third party sources (encyclopaedias, web sites, PDFs, Google Docs etc.). It can open text or HTML files. Most importantly, it can export files in formats including .doc (Ms Word), .docx (Ms Word 2008 or later), .pdf (portable document format) .odt (Open Office document), and .rtf (rich text format). Below the main toolbar is the formatting toolbar. Text can be standard or bullet point (3 options) or ordered (4 options). The font and size can be selected as well as buttons for Bold Face, Italics, Left, Centre, Right and Full Justification. These are followed by Add a new word to the dictionary, a Preferences dialogue box, Screen Shot Reader that can capture and read aloud and text from anywhere on the screen, an icon to bring up a Best Practices and Tips User’s Guide in PDF format and Save or Retrieve documents from the user’s Google Drive. The last icon is to sign out of Google Drive. There are buttons to save the file, print it, export it into other file formats, undo and redo actions, cut, copy and paste text as well as a dictionary. There are four large buttons. On screen in the left hand side of the Ghotit Window is Read Aloud text. It will speak text from the beginning of the document or just text that the user has highlighted. Underneath it is Word Prediction. On the right-hand side is the ABC icon where the user has selected text that requires checking for spelling, grammar and punctuation. Underneath the ABC button is the Tick button that accepts and approves the changes made to the text. Four buttons makes for a simple yet intuitive and powerful interface. Learning the program, after the voices, the preferred regional English language and the dictionary are set up, is a breeze. It caters to users of all ages and abilities. Users can add new words to the dictionary for use with Word Prediction. This is extremely useful for users who are typing in proper nouns, names of characters or places or unusual words, including slang or idiom. It also caters to students studying specific courses or areas of study or interest. There are topic dictionaries where users can add a single word or a list of words in a file that is able to be imported quickly and easily. Dictionaries can be ‘built’ then added or removed. If not required, users can wholly delete dictionaries. Users can hear all of the words in each dictionary. The program is able to be customised to meet the needs of an entire history or geography class – or matched to accurately meet an individual’s needs. It is an excellent example of inclusive technology. When using the word prediction, the user can select a word by pressing the corresponding Function key that is displayed to the left of the word or simply click on it. Users using eye gaze can dwell on the function key and thus enter the complete word without having to finish spelling out or typing long or complex words. Another wonderful edition to this version is Dictation. It is nowhere near as advanced as Dragon Naturally Speaking, but it does serve a purpose for those users who can speak well and are articulate. Simply locate the Edit menu and choose Start Dictation. I used the inbuilt microphone on my desktop MAC and it worked very well. I then used a $300 desktop microphone and the result was excellent. Students will be able to use headsets in class that have unidirectional microphones so that they can dictate (or speak their text) as well as listen with privacy and less distractions and avoid background ‘busy’ classroom noise. It works similarly to SIRI; but it does not have editing commands. It could prove to be handy for some users. Note: There are other Apps available for Apple portable devices (iPad and iPhone, Chrome Books, MS Windows computers and tablets, as well as Android devices and Smartphones. Users can link to https://www.ghotit.com for more information. Either install Ghotit Real Writer and Reader from the Internet or install it from the Ghotit CD. The installer will require an internet connection only for the installation and to download the Best Practises User Guide. Download the .dmg (for MAC OS) installation file then copy and paste the Ghotit App icon to the desktop. Then double click on it to launch. The set up wizard guides the installer through the process, with only a few steps required. This is where the user can determine and adjust the voice settings as well as the required English Dictionary. These can be changed later at any time to meet the user’s needs. Then the user will have to enter the username and password (all case sensitive) – supplied by Ghotit or their distributor/dealer. When successfully completed, the user is greeted with "Welcome to Ghotit". The next step is to configure the F-Keys, as these are handy short cuts used in the software. The users launches Ghotit, clicks on the Apple icon, chooses System Preferences, then the Security and Privacy icon then the Privacy icon. Then the user selects Accessibility. If the dialogue box is locked (as it should be) untick it by providing the administration password. The user then selects the checkbox left to the Ghotit App to provide keyboard access so that the F-Keys can be used and integrated with other MAC applications. Then the user needs to lock the dialogue box again, close System Preferences, close the Ghotit App and then restart Ghotit Real Writer and Reader and the user is ready to begin writing, editing and note taking. Google Docs is a powerful online tool. Unfortunately, people with dyslexia and dysgraphia have problems using it due to their reading and writing limitations and this can cause frustration. Ghotit Real Writer and Reader acts as a simple-to-use text editor which, integrated with Google Docs, solves their productivity problems. Ghotit’s writing and reading inclusive technology including word prediction, text-to-speech including dual highlighting with human quality voices, context and phonetic spell checking, grammar and punctuation checking is able to be customised to fully meet an individual’s writing and reading needs. These capabilities are available both online and offline. The software opens Google Docs documents inside the Ghotit Writer Editor, a simple to use editor with only main functions and big clear buttons, word-prediction option, text correction and in-place reading aloud with dual-highlighting colours. This means that the user is supported with these enabling features compared to editing in Chrome, even with many other assistive options available. After editing, the file is automatically synchronized with Google Drive. If the connection is temporarily unavailable, the software will remind the user to synchronise it later. Multiple Google Drive accounts could be used by signing-in and signing-out to/from an account. This enables the student at school or University/TAFE institute can work on the document when they get home. They are able to be independent at school or workplace and not rely on assistance as the software helps them correct their text wherever they are working. One aspect that delineates Ghotit Real Writer and Reader from some other products on the market is that when you pay for a licence, it is NOT a subscription. There is an option for subscription, but it’s only for single licenses. The user owns the program and can use it indefinitely. If a new version is released, the user has the option to update or buy the new version. Subscription based software can be a trap as the user has to pay EACH YEAR. Users often forget, can’t afford to subscription costs or schools and institutions do not adequately budget for the year’s new subscription cost. Ghotit RW&W can be purchased in Australia from Spectronics in Australasia. It is sold as a single licence AUD 380.00, the school/institute site licence for AUD 2000 for up to 100 users (that is, AUD 20 a copy) or a home and school/institute licence for AUD 2770 for 100 users. This would be my considered option for most large schools or universities. The student can therefore have it at school and at home. Teachers can also install it to learn the software and become accustomed to using it. A multi site (i.e. a school that has more than one campus) for up to 100 users is AUD 3540 and a multi site and home licence as well as home use for up to 1200 users is AUD 4920. Users in different countries can always go to the Ghotit website for prices in their currencies as well as site licences. Mac OS 10.7 operating systems and later on desktop, Air and Apple Books. Memory: 4GB at least although 8GB or more is recommended. Local disk space required for the program is just over 1GB. Note: One-time only connect to the Internet for the license activation. This software review was written in October 2018 by Gerry Kennedy © running MAC OS 10.12.6 with 12GB RAM using MS Word 2008 and Ghotit Real Writer and Reader for Mac. The author acknowledges Ghotit for providing a copy for review purposes. ClaroRead for Mac works on Mac OSX V10.11 and above. ClaroRead V6 for Mac is a highly effective literacy software solution for supporting people who struggle with writing, editing and reading text. It has been created and designed with maximum simplicity and flexibility. Users of any age and ability level, when dealing with text and documents, now have the opportunity to employ numerous powerful literacy support options and assistive technology features to help them handle information and data when using ClaroRead. 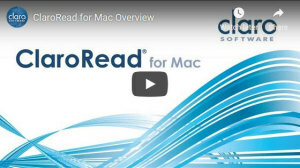 ClaroRead for Mac is a simple to use literacy support tool designed for Mac users. The MS Windows version has the same features. ClaroRead can read any on-screen text out loud. By design, it is perfectly integrated with Microsoft Word but you can use it with any word processor such as Pages or Open Office, presentation or mind-mapping tools or with text editors. It is extremely handy when reading, researching and accessing text from the Internet or from within stuffy or work documents in PDF format. With ClaroRead Plus, users or educators can easily scan pages or entire books and documents (i.e. within copyright regulations and permission). Omnipage OCR (Optical Scanning Reader) software is embedded in ClaroRead Plus and is an accurate and powerful scanning technology in its own right. Scanned documents, locked PDF files, eBooks and even text embedded in photos can then be edited and annotated. Text can be spoken aloud using human quality voices and this directly helps non-readers or struggling readers. Some students find researching and studying difficult or impossible as they struggle when reading text from their assigned novels or curriculum materials, especially in hard print books and handouts. Parents or teaching assistants (or School Support Officers) can scan pages of books and convert them quickly into accessible text or straight into MS Word documents. This allows the student to access materials that would have been frustrating to study. In addition, they can convert the scanned text into audio using ClaroRead Plus. They can then opt to listen to the text at any time in any environment on their Smartphone, iPad or MP3 player for pleasure or for study. Karen and Lee, two Australian voices, are included. Up to 80 MAC voices can be downloaded from the Claro Software web site, at no cost. All of these voices are clear and many are foreign languages, so the program sits very comfortably in ESL (English as a Second Language) as it does in LOTE (Languages Other Than English). A diverse range of visual tools is included. Text colour, highlight colour and a focus on the text while spoken by the computer provide multi-sensory support. This provides useful and practical options for users who have Irlen Syndrome (or Meares-Irlen Syndrome), often described as Scotopic Sensitivity Disorder. It is a perceptual processing disorder. It is not an optical problem. It is a problem with the brain’s ability to process visual information. This problem tends to run in families. It is not currently identified by other standardised educational or medical tests. ClaroRead Plus improves written accuracy with an enhanced spell check, a very handy and useful homophone check and an integrated thesaurus. Words and sentences can also be spoken back as they are typed. To conform to Universal Design standards, ClaroRead is easily customised to cater to meet individual needs. Users of all ages and abilities can use it gainfully for learning and working. People with dyslexia or learning difficulties often despair, especially younger students. One in ten students has been the quoted number of users who struggle with text. As students progress through school, they ‘dumb down’ their written content as the bigger or more complex and confounding words are too difficult to write or type correctly. So, they use smaller and less complex words. They are usually very intelligent and divergent thinkers but are constrained by their lack of ability with phonics or word recognition. Their brains cannot adequately process text and may have reading and or writing difficulties. Every child or adult is different. If they are provided with the necessary literacy supports, they can attack and handle classroom or workplace documents, Internet research or study or research materials with increased confidence and success. They are able to work with text and operate at a much higher level and demonstrate their abilities and understanding of content. Many are visual learners and require aids to help them process information so the mind mapping tool in ClaroRead Plus will assist them in organising their text in meaningful ways. Schools tend to overlook these students, labelling them as lazy or not trying. This further frustrates them and often leads to disengagement and poor behaviour. It compounds as they grow older, losing confidence and falling behind their peers. They are often articulate and quite eloquent and have a range of extra curricula hobbies, yet the restrictions of classrooms and curricula inhibit their skills. Programs such as ClaroRead Plus (and others) provide Universal Design features that are inclusive and promote well-being and equality in the classroom or workplace. Young people can be more resilient and independent when given appropriate tools that accurately meet their needs and assist them in developing other skills. It’s not a cure or a quick fix. 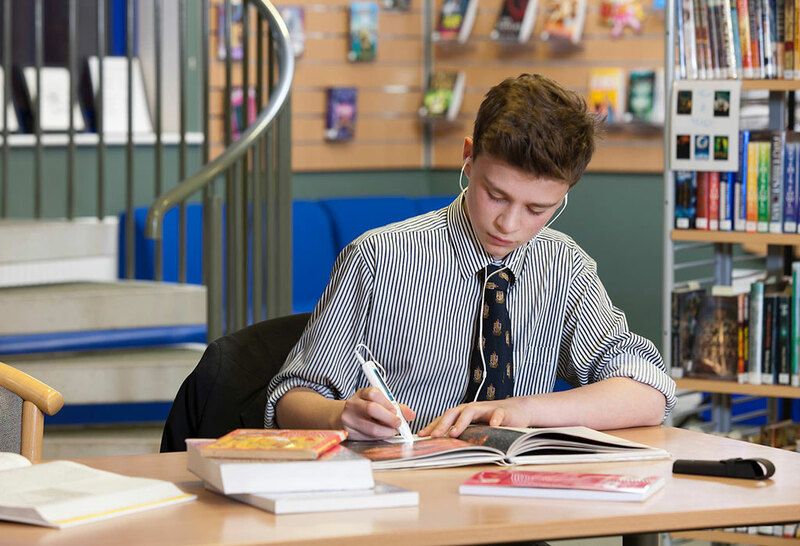 More often, the provision of literacy support tools removes the stigma of learning difficulties and students see themselves as achievers, not failures. Dysgraphia is a specific learning disability that affects written expression. Dysgraphia can appear as difficulties with spelling, poor handwriting and trouble putting thoughts on paper. Dysgraphia can be a language based, and/or non-language based disorder. Students with dysgraphia require products such as ClaroRead Plus so that they can type their stories or research with tools that help them edit their work. Handwriting can be a huge dilemma and impediment. School should not insist that these students write by hand (for the majority of their work) as it is slow, laborious and even often painful. Using a keyboard and a computer, notebook, laptop or iPad with a keyboard provides them with the necessary tools to complete their work. ClaroRead Standard – Contains all the core features of ClaroRead for Mac. 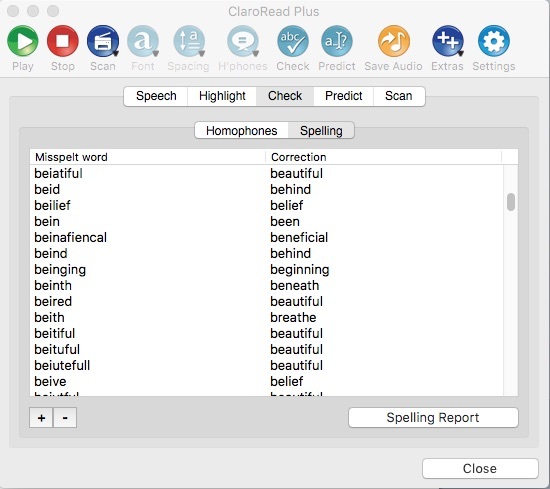 ClaroRead Standard supports users who struggle with reading and writing with text-to-speech, save text to audio, homophones/spell-checking and word prediction. It includes very useful ClaroIdeas, ClaroView, ScreenRuler, ClaroCapture for Mac and ClaroSpeak Mac apps. 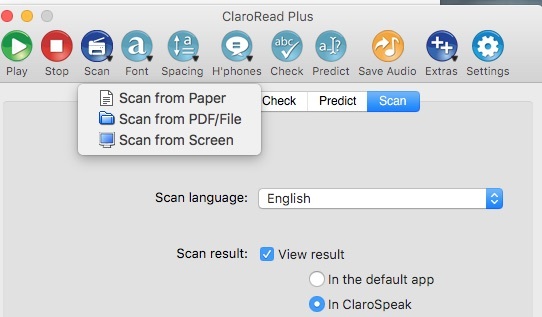 With ClaroRead Plus, you can also scan any paper documents or convert any locked or unlocked PDF file into accessible formats for text-to-speech, editing with complete and full accessibility. Study guides, lesson or lecture notes, user manuals, encyclopaedias are all accessible for non-readers or people struggling with text. 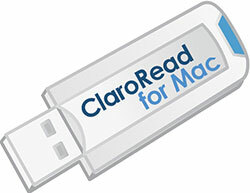 ClaroRead Standard for Mac USB provides users with a portable 24/7 solution, to be used anywhere and at any time on any computer (Mac OS or MS Windows USB versions). Rather than buying a separate USB version now, users can make their own USB version using Claro’s USB creator and inputting their licence key. This will create a USB Standard/Plus/SE version and users can select which voices to install onto the USB also. 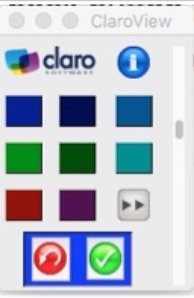 See https://www.clarosoftware.com/usb for more information. This means that users can use ClaroRead in any environment and are free to access all of the powerful features whenever they are required. The USB edition includes ClaroRead Standard and runs directly from the USB – no files require installation on the host’s computer, notebook, laptop or tablet. The USB solution includes two popular Nuance Vocaliser Australian English Karen and Lee voices. 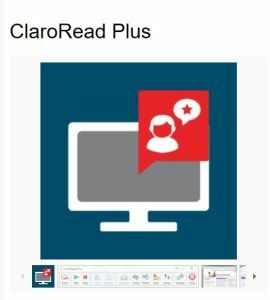 ClaroRead Plus is displayed onscreen as a single toolbar for use in conjunction with any text-based program, including the ubiquitous MS Word as well as other word processors, text creation programs, mind mapping and presentation tools as well as any website. It combines a homophone and dictionary checker, font and spacing commands, thesaurus and spell checker. In addition, a very handy and useful “save to audio or video” function provides auditory and visual supports to learners who have auditory difficulties. The coloured icons are intuitive in design and created for ease of recognition. It provides a text-to-speech facility that works with any text in almost every context of computer use. 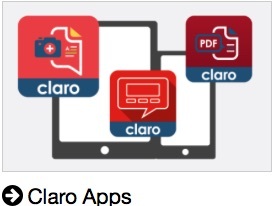 There is a range of voices included within the software as well as many others that are free to download from the Claro Software website. 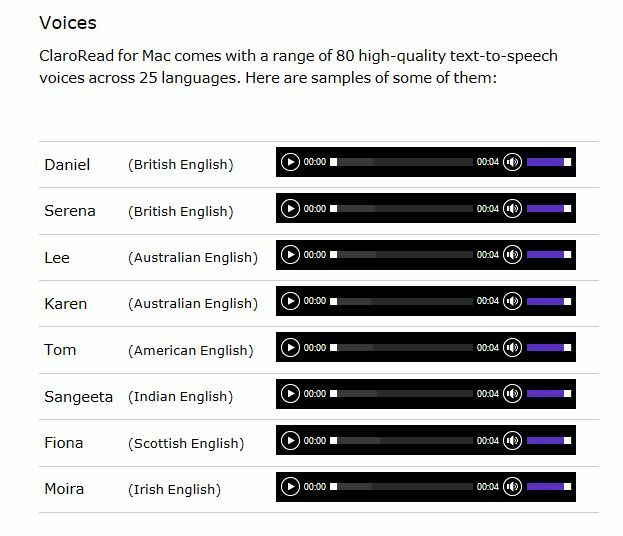 There are 80 human quality voices for the Mac OS computer platform in 25 languages. The speech is natural and users can elect to have text spoken aloud at any rate they wish be it fast or slow. In Settings, Speech dialogue box, voices can be changed as well as the rate (or speed) of speech. The first button on the horizontal toolbar is the Play button. Speech can be played back upon text entry by character and or word or sentence. Speech feedback is available at any time using highlighted text and clicking on play. The Stop button is next. It stops the speech feedback. When text is read aloud, the user can elect to have pauses between words and stop after every sentence or have continual playback. Speech can also be used with a click of a mouse on a word or as the mouse hovers over text. When text is scanned, it can be spoken immediately as well. A ‘pronounce text’ option is available in Settings. Users or educators can type a place or person’s name or an unusual word and the pronunciation can be added. Words that are more familiar to the user can be pronounced according to the local speaker and reader. Words can be added or deleted in the list at any time. As text is read aloud, synchronised highlights can be used to assist the user track each word as it is being spoken by a male or female Australian, English UK or English American voice. Other non-English voices are available and the speech feedback is spoken in that language. 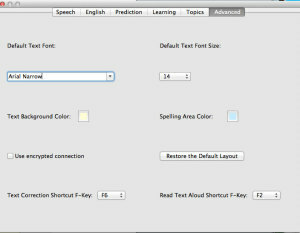 Dual colours of text and text background are available to accommodate users with the coloured highlighting synchronised by word, word trail, sentence, paragraph or on a focus sentence. This works in MS Word. The third button is the Scan button. Users can elect to select any text on the screen in any application to have it scanned then they can hear it read aloud – from Google Books, inaccessible PDFs and web pages. The text is OCR’d to enable users to read anything they need to study, research or memorise. Text can be scanned from paper, from a PDF file or from the screen. The text is spoken immediately after the scan has been performed. With ClaroRead Plus the powerful OCR technology means that any paper document, handout, leaflet, user manual, book or PDF file becomes fully accessible. Curriculum or textbooks, photocopies and handouts are easily converted into Microsoft Word documents, Pages documents or accessible PDF files. The text can be spoken out loud by ClaroRead or edited. Most critically in tertiary settings, PDF files can also be unlocked and edited. Any text is accessible and this ensures that no student or worker is disadvantaged by not being able to read. The fourth button is the Font option where text can be increased or decreased in size. Or the font can be changed to Comic Sans MS, Trebuchet MS or Arial, all non-serif fonts that are easier to read on screen and/or in hard copy. The font colour and highlighting can be set as well from this drop-down menu. The fifth button is Spacing. Users can change character, line and paragraph spacing. This is so important for many users who need to have the text spaced out so that they can ‘see’ the individual words instead of a muddle of text. This button will reveal or show all homophones in selected text. The second option is to clear the homophones. The seventh button is the spell check. Users select or highlight text and then click on Check. Words that are incorrectly spelt will be underlined. People are able to spell check any text in any application, whether it be a web page, MS Word document or PDF file. 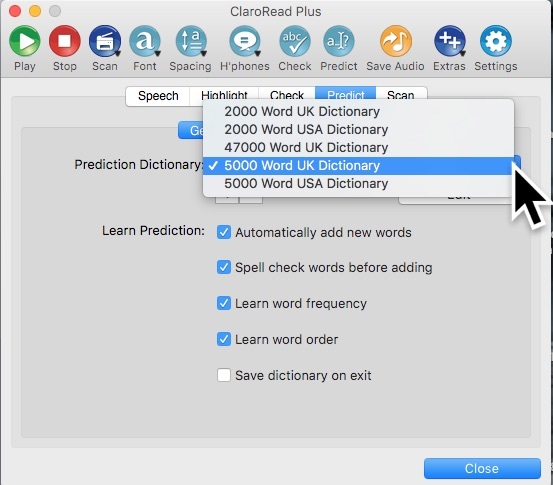 ClaroRead provides a single Check button that combines a homophone dictionary, thesaurus, reference dictionary and spell checker, making the checking of the text and documents easier and more comprehensive. The program can learn new words or users can add words to the dictionaries at any time. 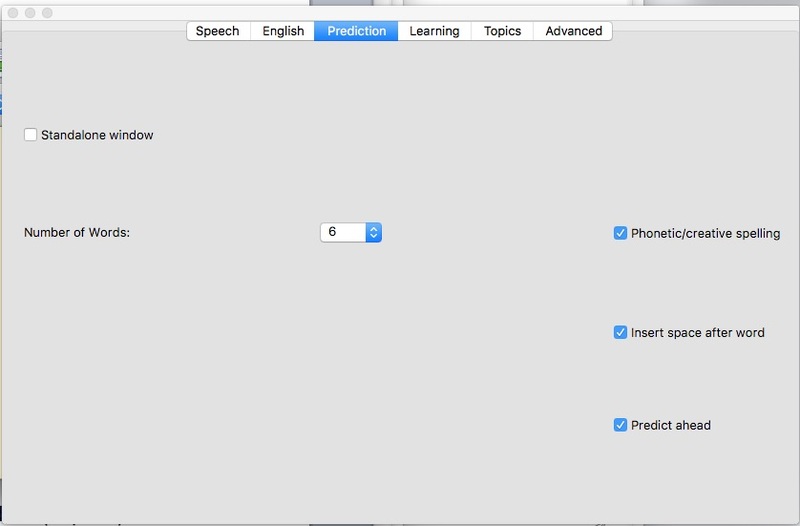 The eighth button is Predict, which brings up the word prediction option. In settings, users can select from one of five built-in dictionaries, each with thousands of commonly used words in UK or USA dictionaries. Users or educators can have new words added automatically, spell the word before adding it, learn word frequency, learn word order or save the dictionary upon exit. These are all selected and ticked or unticked in Settings. The Word Prediction feature can be useful for certain computer users. With constant use and practise, users can become more fluent and faster with text entry, using correctly spelt words. ClaroRead uses a base prediction consisting of the most frequently used words in the English language. The dictionary learns as words are entered from the conventional, onscreen, external mini or enlarged keyboard and rejects words that do not pass the automatic spell check. People of all abilities are able to convert any text into an audio file using a high-quality voice. They can then play the file back on a music player such as an iPhone or iPod Touch. The audio format used is the .aiff standard. It is so easy to use. Simply select and copy some text then click on the ninth button Audio. It offers users the opportunity to save text from documents and web pages so that they can listen along with the written text or on the move going home on the train or bus. The last button is the Extras buttons. A collection of additional Apps are available as stand-alone programs. This is a handy speaking calculator as the first option under the Extras button. It launches the Mac calculator and is speech enabled. The second extra feature is ClaroCapture. Once selected it runs in its own small window. Users can capture text, highlighted text in MS Word or be captured from the screen. The captured text can also be revealed when the user clicks on the third option, Show. ClaroCapture is used to collect and gather text from any document or web page, then it groups it as a project file. This research file can be sent to MS Word Google Docs or MS PowerPoint. It can also extract highlighted text from Microsoft Word documents. ClaroCapture is an ideal study skill and research tool. ClaroView runs as a stand-alone program. The entire background of the screen display can be lightly tinted in one of eight colour options. It caters beautifully to people who have Meares Irlen Syndrome or for users who wish to avoid eye strain from bright screen displays and require colour tinting to read more effectively and efficiently. The common use of black-on-white text is not always the best option for some people. It is hard to read for some users and they prefer or critically need off-white colours. ClaroView provides a coloured overlay for the whole screen so everything is tinted and easier to read. A user can select any colour he or she prefers or requires and then quickly change colour and intensity depending on the time of day, the light conditions in the environment in which they work or study and then ascertain the most ideal combinations. This visual support may help users who have vision impairments or have Meares-Irlen Syndrome. Irlen Syndrome (also referred to at times as Meares-Irlen Syndrome, or Scotopic Sensitivity Syndrome, and Visual Stress) is a perceptual processing disorder. It is not an optical problem but a disorder with the brain’s ability to process visual information. ScreenRuler allows part of the screen to be highlighted or underlined depending on the user’s preference. ScreenRuler assists users when viewing text on-screen. It provides a strip or ruler across the screen, which can have the contrast changed and have the background coloured or greyed out. Users can use ScreenRuler to highlight or underline text depending on the user’s preference. It can assist users when viewing text on-screen (particularly web pages). Users can change or alter the contrast and have the background coloured or greyed out. This is a very useful and simple to use and learn mind mapping program or App. 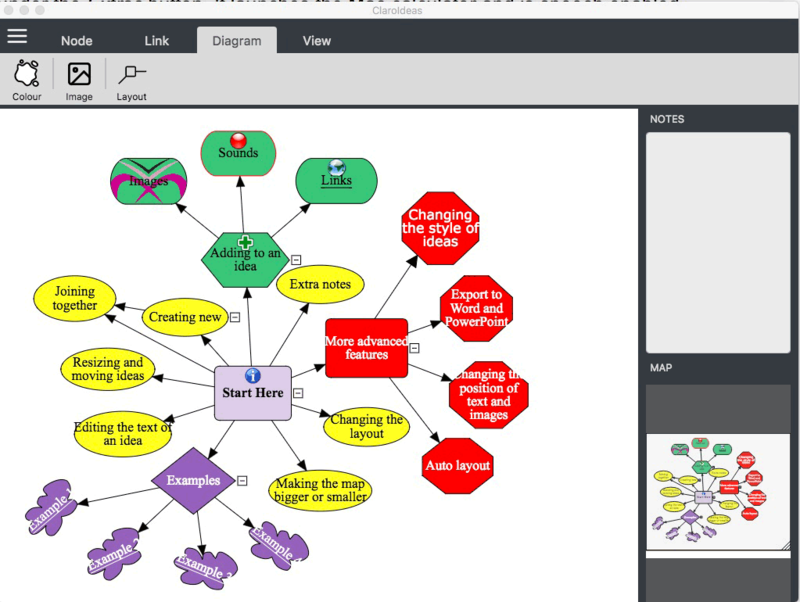 It allows users to create mind maps or charts to break down complex ideas into smaller tasks or pieces of writing. It has many of the features of other popular mind mapping tools and text and graphics can be used to generate idea maps and assist users who need to clarify or arrange information diagrammatically. Visual learners will thoroughly enjoy this extra but important tool. Ideas can be lined to each other as well as hyperlinked to URLs on the internet. There are 12 non-serif fonts from which to choose, ranging from 6 to 18 point in size. The background can be an image imported from any hard drive, USB or external drive or memory card and used as a background or as integral to a fact or idea. This App is a simple but very useful text-to-speech reader for PDF (Portable Document Format), Microsoft Word Docx files, RTF (Rich Text Format) as well as HTML and plain text files. The installation was very straightforward. After downloading the .pkg file from the web (for a MAC OS installation. The MS Window file would be in .exe format, I then double clicked on the file. After launching the software, the ClaroRead plus was installed into my applications folder. I typed in my registration code and the software was ready to use. When purchased from Spectronics in Australia, the following MAC OS licences are available. It is NOT a subscription. Once purchased, the user can use the software indefinitely without having to subscribe and pay each year. Subscription software is a hassle for everyone, the school or University technicians, parents and users themselves. ClaroRead for Windows PC also caters to people with dyslexia and learning difficulties, especially in writing, editing and reading of text based material. ClaroRead is a simple and friendly feature-rich software program that helps users to write, read, study, sit exams and increase their confidence and ability to handle text. Users can access any on-screen text and have it spoken out loud in a variety of human quality voices. ClaroRead Plus and Pro have a tool to scan paper books, PDFs, photos, onscreen ‘graphics’ of text (e.g. the rules of an online game) and text in documents. As with ClaroRead for Mac, it is feature rich with all of the necessary literacy supports to ensure users are comfortable and confident when handling text-based programs, PDFs and the contents of web pages. ClaroRead for Chromebook supports writing, reading, research and study on Chromebooks. 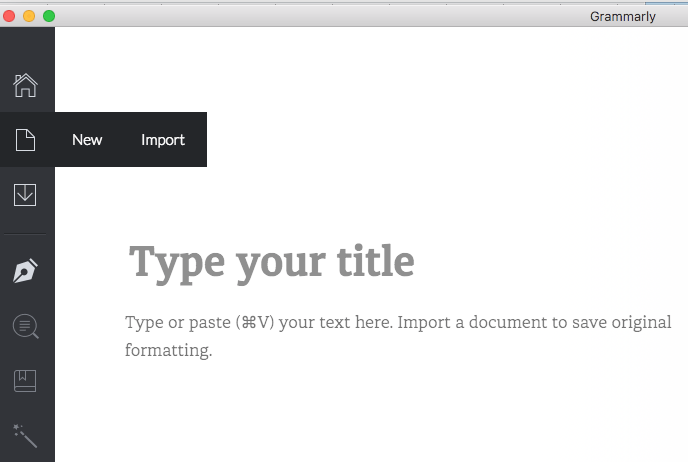 It assists users in their text creation and works within Google Docs. Users are able to read, listen to and research PDF files and web pages, and then organise their thoughts together with inbuilt mind mapping. ClaroRead is used worldwide in schools by hundreds of thousands of users with and without dyslexia and print impairments. Google Docs is a great innovation but lacks the support for users who struggle with text creation and proofing/editing of text within their documents. Collaboration with other students (or with colleagues in the workforce) is easier. They can have confidence in that their contributions, using all of the literacy supports within ClaroRead, are able to be corrected and edited. Users can opt to have their text spoken aloud and spell checked, together with homophone support. ClaroRead for Chromebook is provided as a free download. Once students become accustomed to the features that provide greater independence and freedom when working with Google Docs, the school, institute or workplace can elect to purchase a site licence to unlock its powerful premium features. 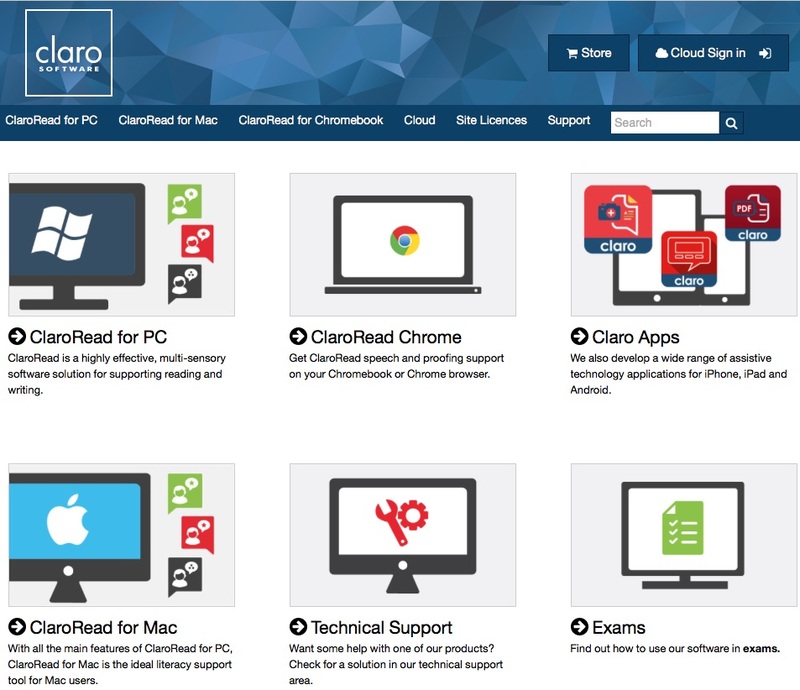 ClaroRead Cloud gives schools and tertiary institutions the capacity to provide Claro software’s text-to-speech, reading support, and document conversion (OCR) across any device – MS Windows machines, Mac OS devices, Android phones and tablets, iPads and iPhones as well as Chromebooks. ClaroRead Cloud consists of two web apps, ClaroRead Cloud OCR for document conversion and ClaroSpeak Web for text-to-speech. These two program extensions run a user’s web browser. This means that the student is fully supported (or worker) when using his or her preferred learning or productivity device. It might be a desktop, notebook, MacBook, laptop, tablet or Smartphone. The beauty is that it does not require installation. Managementis easy and access is universal. This software review was written in October 2018 by Gerry Kennedy © running MAC OS 10.12.6 with 12Gb RAM using MS Word 2008 and ClaroRead Plus. The author acknowledges Claro Software and Spectronics for providing a copy for review purposes. Ghotit Real Writer and Reader, recently upgraded to Version 7.4, is a standalone software program, available for MS Windows, Chromebooks and MAC OS computers. Once installed, it does not require further Internet access. Users can work with Ghotit RW&R with any preferred word processor or text entry tool, website or program. With younger students, it can be used as the user’s main word processor, if required. Text can be copied from programs such as Google Docs, Pages, OneNote, Inspiration, or MS Word by using copy/paste or by selecting up to 1000 words and pressing Fn-F6 keys or by using the ABC button of the Floating Toolbar. Grammarly helps students and writers expand their vocabulary and also assists in improving their writing. There are benefits for non-native English writers and ESL students (English as a Second Language) as well. Tertiary students and professional writers use Grammarly to advantage as it assists in spelling and proper use of grammar in English text. Grammarly’s products help people to communicate more effectively to ensure that their emails, messages, documents, and social media posts are clear, mistake-free and correct. Products such as MS Word™ and other productivity tools have grammar checks built-in but Grammarly takes it a step further. It ensures that are grammatical errors are captured and highlighted so that users can edit with greater confidence. I downloaded the free version. Grammarly is an automated proofreader. It checks for more than 250 types of spelling, grammar, and punctuation errors, enhances vocabulary usage and suggests citations. Note: The Premium version offers other enhancements and features. The user creates an Account and logs on each time he or she wishes to use it. 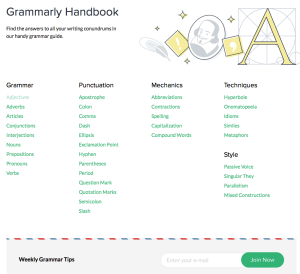 Grammarly’s algorithms flag potential issues in the text and suggest context-specific corrections for grammar, spelling, and vocabulary. Grammarly explains the reasoning behind each correction so that the user can make an informed decision about whether, and how, to correct an issue. 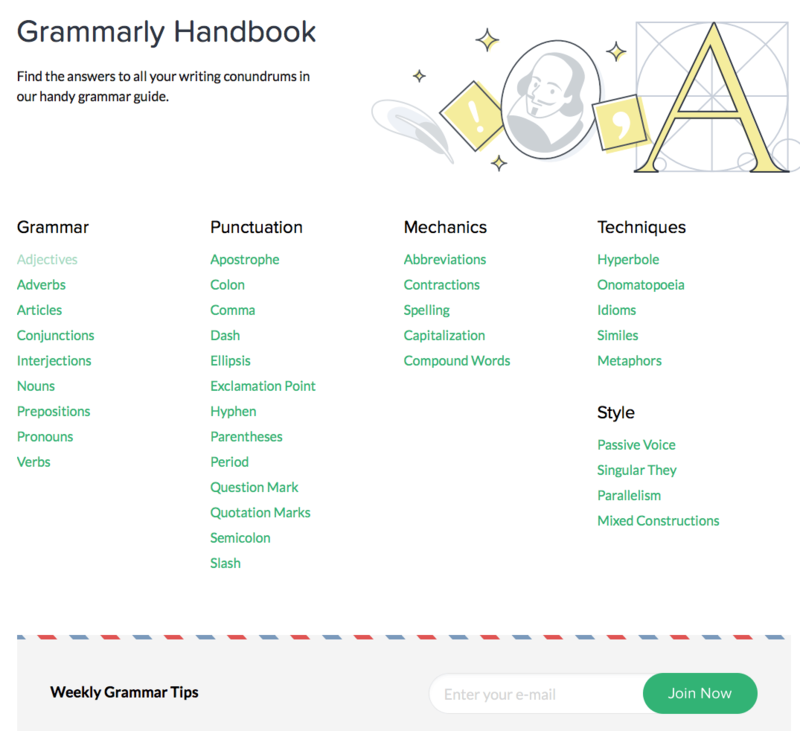 Users learn more about sentence construction and proper use of grammar by using Grammarly to proofread their texts. Grammarly for Firefox brings Grammarly’s powerful algorithms straight to the user wherever he or she is writing online, including Facebook, Gmail, Messenger, Pinterest, GooglePlus, LinkedIn, Twitter, and Tumblr. Users can correct mistakes in their text with just a single click. It is an ideal tool for anyone who writes. Grammarly can also assist users who use voice dictation, including Dragon Naturally Speaking. Users sometimes use language verbally that is not grammatically correct. They might use colloquial, slang, local terms or phrases or take ‘short cuts’ in language. 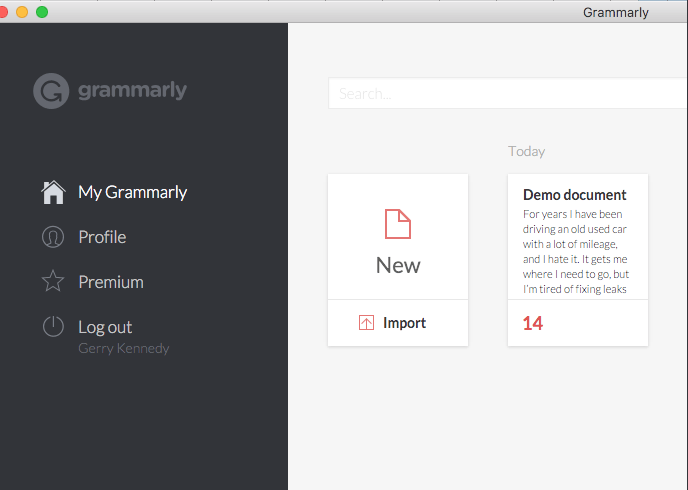 Grammarly will analyse their speech as text and correct any errors. Used side-by-side, writers can be more productive and create documents quickly knowing that their text will be error free. Once downloaded and installed on my Mac, I placed a shortcut on the launch bar. It opened in a new resizable window. It had some sample text with which to explore. When a user launches Grammarly, he or she is invited to type in name, email address and password. This gives the person an account with Grammarly. There is no cost. If the user chooses to import a document, the original formatting is kept intact. Errors are shown in red. Potential corrections are shown in green. It will also list multiple words if it does not recognise the word. If new, unknown or correctly spelt words (from a particular genre, a proper noun or a character’s or location’s name) then Grammarly gives the user an option to add it to the program’s dictionary. When a new or existing document is clicked (or selected), a new menu appears. When the user clicks on New, the choices are New or Import. If the user begins a new document from scratch, he or she types a heading then begins typing the body text. Users can cut/copy and paste text into the window at any time as well. If Import is selected, then a navigation window appears where the user can locate documents (e.g. .txt or MS Office docs) from the desktop, documents or Dropbox folder(s). It will not open PDF files. The user proceeds to type or add text, by conventional keyboard, onscreen virtual keyboard, using eye gaze technology or from a Bluetooth model keyboard. Alternately he or she might be speaking into a microphone, e.g. using Dragon Naturally Speaking software (a highly regarded voice recognition program). The next icon is Export. The file can be exported as a partly or wholly finished product as a text file. Another option is to copy all or part of the text and paste back into an original document in MS Word or a new document in another productivity tool (e.g. a mind mapping program). It could also be pasted into a social website such as Google Docs, Facebook or Pinterest. When the user clicks on the Home icon, he or she can then choose Profile (under My Grammarly). Under Profile, there are three options coloured in red. This is where users can personalise the built-in dictionary and add words peculiar to their study, research or workplace. The words will no longer be flagged as misspellings or errors. Every time the user logs on to Grammarly, these new words will be included in their personalised dictionary. There are hundreds of words that changed their spelling after they crossed the Atlantic Ocean. In some cases, American English simplified spellings by dropping extra vowels; in others, American English preserved older spellings of words that continued to evolve in Britain. In particular, these spelling differences concern vowels, double vowels, and suffixes such as -ize/-ise or -yze/-yse. There are a few subtle differences in grammar between American and British English. For example, in American English, collective nouns take only a singular verb, but in British English, they can take a singular or plural verb. The last option under Profile is Account. The user’s name, email address and password (shown as a series of ‘…’) are displayed. Each can be edited and the account deleted if so desired. The next option is Premium. This clearly outlines the benefits when purchasing the Premium version of Grammarly. Integrates with Microsoft Office® -Grammarly works great inside Microsoft™ Word® and Outlook®. The next option under Premium is Log Out. The user can elect to log out and finish the writing or editing session. Another sibling, schoolmate or colleague could then log in with his or her account details. It is an ideal tool for the business world, for professional writers and people whom frequently Blog or add social commentary to websites. At the bottom of the screen is Support. This links to a very comprehensive web page that offers other numerous options that the user can explore. 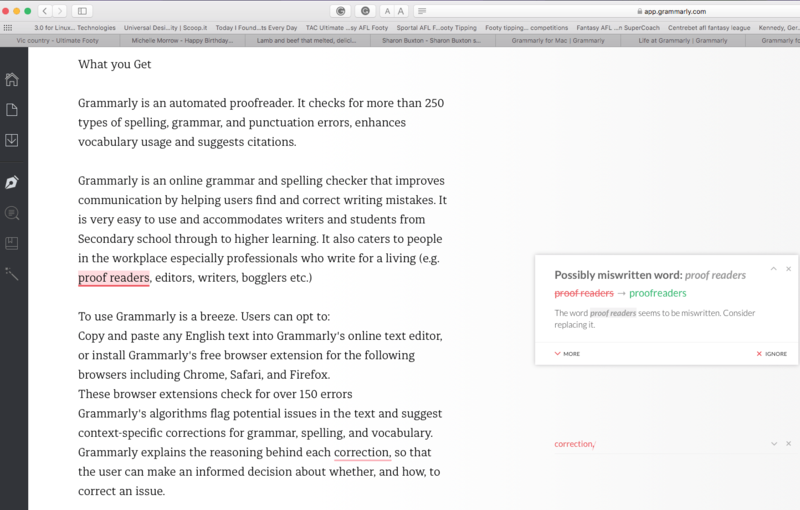 Grammarly corrects spelling, grammar and punctuation errors in English text. It helps writers use more direct and clear language. It improves a user’s grammar, as a good English language teacher would do. Students of all abilities can proof their own work before submitting for assessment and appraisal. It also caters to academics and students studying in tertiary settings or adults in training or in the workplace. 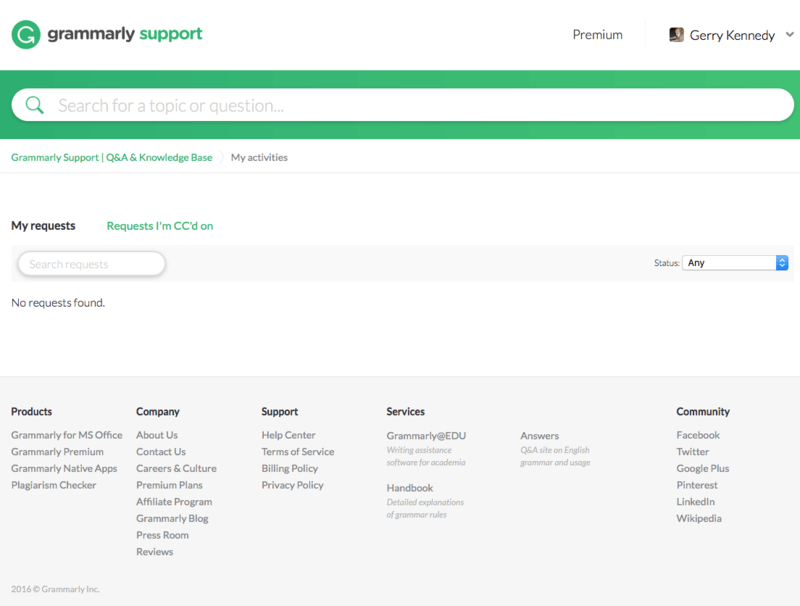 Extra support is online with FAQ section and a Grammarly Answers page where users submit questions about sentence structure or use of words and other users respond. It is an interesting exercise to read the examples and the solutions. An excellent resource is the Grammarly Blog. There are four sections; Writing, Grammar, Handbook and More. I found the Handbook to be especially useful as a teacher as it provides a wealth of information about the English language. It covers areas of grammar, use of punctuation, the mechanics of writing and techniques and styles. Simply link to https://www.grammarly.com/native/mac for the Mac version. Users can also download https://www.grammarly.com/office-addin/mac Grammarly for the web and Grammarly for MS Office™. Colleges, universities, professional educational institutions, middle and high schools, and even businesses can purchase site licenses that include a one-year subscription. Grammarly will help teenagers to adults to type and communicate more effectively. As the user types, Grammarly flags mistakes and errors and helps users compose messages, documents, and social media posts clear, mistake-free, and impactful. Users can compose text in their chosen application and then copy/paste into Grammarly. If it is a Microsoft Office document, they can drag it into the Grammarly window. It not only alerts the user to grammatical errors but also explains why it could be in error. Potential mistakes are seen to the right of the text and are clearly designated and explained. The program is simple in design and execution but very powerful in what it provides. Users will, over time, improve their writing and learn more about the rules of English grammar. Users can find the perfect word every time with context-optimized synonym suggestions. 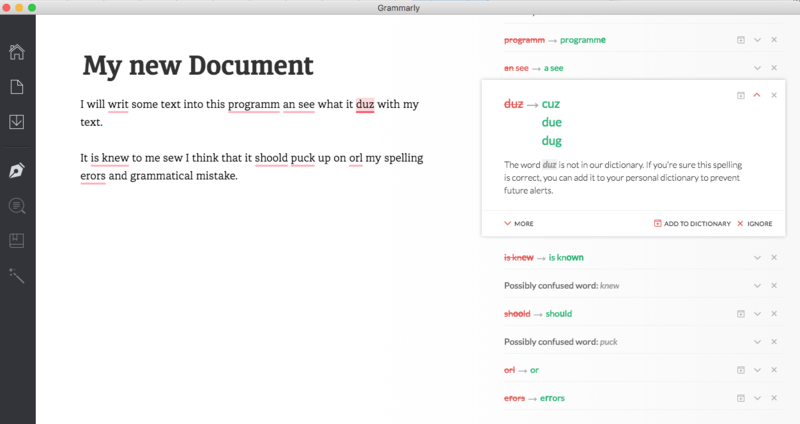 Editor’s Note: This product review of Grammarly V1.5.6 was written and composed in June 2017, using a Mac desktop running Mac OS 10 Sierra. It will work with MS Windows and Mac OS computers, notebooks, tablets and desktops and there is a separate version for the iPad. All updates, even in the free version, are free. Note: All images in this review are copyright to the Grammarly. For users who want to supercharge their writing performance and leave no errors unchecked, Grammarly Premium is a paid upgrade that checks for over 250 types of grammatical errors, provides vocabulary enhancement suggestions, detects plagiarism, and provides citation suggestions. Grammarly Premium also includes Grammarly for Microsoft® Office, which allows users to employ this accurate grammar and spelling checker without leaving their Microsoft® Word™ document or Outlook® emails. Grammarly Premium is available through three different subscription plans: Monthly Quarterly or Annually subscriptions are available. 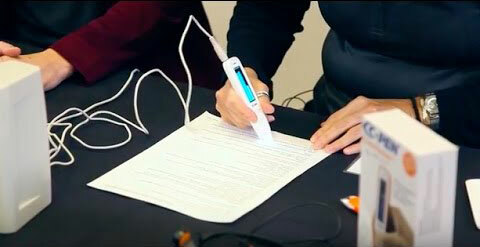 The C-Pen Reader Pen is a portable handheld assistive technology that helps users with dyslexia or other literacy difficulties, essentially when reading printed text. The C-Pen is for users with dyslexia or for people who struggle with certain genres of text or who are just poor readers, learning to read, people with ESL needs, LOTE users who speak and want to learn Spanish or for educators and parents assisting students who can’t read. Text can be read aloud from novels, books, magazines, brochures, handouts, labels and other hard copy media and documents. People deal with text every day, whether it is at school, in work training, in the workplace or even when shopping or going to a restaurant. 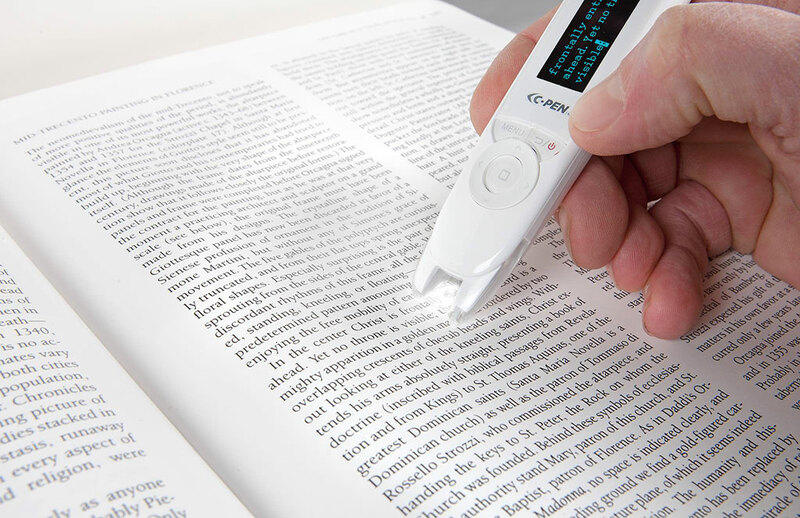 The portable and lightweight C-Pen Reader Pen overcomes the barrier of not being able to read. It empowers non-readers, struggling readers or people who have English (or Spanish) as their second language in order to access text for a whole variety of purposes. Imagine the independence of being able to read instructions, the newspaper or the ingredients for a cake from a recipe book without having to ask another person (wife, husband, partner, teacher, school support person, trainer) for assistance – for the first time! As an adult, it is embarrassing and frustrating not being able to read. It restricts a person in so many ways. The C-Pen provides that level of independence. Users can access printed text at any time and in any lighting conditions. The C-Pen has an integrated Collins 10th Edition English Dictionary and 30th anniversary Oxford dictionary. [Note: There is a 4th Edition Spanish dictionary built in as well]. It displays text in three lines in bright blue text on a black background. You can adjust the brightness at any time to suit the user’s environment or visual needs. 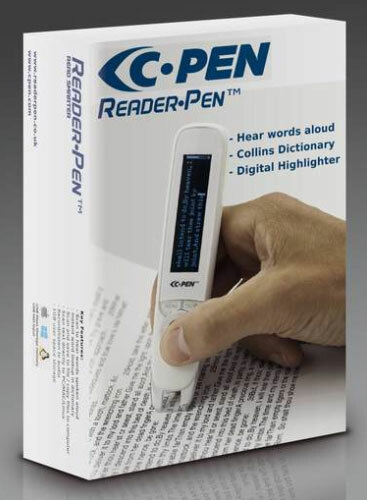 The C-Pen Reader Pen uses powerful optical character recognition OCR (i.e. Optical Character Recognition Technology) to process then read aloud, any printed text from point size 6.5 to 22 [Note: 72 points is one inch high]. As the C-Pen is moved either from left-to-right or from right-to-left, the technology ‘reads’ the ink on the printed media and converts it into editable text. Users can opt to have it read aloud immediately after it is scanned (or selected) or as a continual piece of writing (e.g. a paragraph page or chapter). Text can be erased or appended and stored in the C-Pen and read back at a later time or transferred to a computer for study, editing or data collection purposes. The device can additionally be used as a “keyboard” when it is connected via the USB cable into a computer. As the user scans the text, it is typed (as if typed from the user’s keyboard). This can save huge amounts of time retyping text, especially for support personnel in schools. The student may have dysgraphia and may find copy typing difficult due to poor writing and/or typing skills. Individual words can be defined from one of the Dictionaries (English ort Spanish text) and read aloud. With the integrated dictionaries, individual words can be highlighted one at a time, at the user’s own pace, and the definition read aloud. This is empowering for dyslexic children and adults who struggle understanding complex words but prefer to hear words read aloud to them. It also assists ESL (English as a Second Language) and for LOTE (Languages Other Than English) learning the Spanish language. Packaged with The C-Pen Reader Pen are a headphone jack and an earpiece (using the standard earphone 3.5mm jack) so a user can use it more discretely if he or she is listening to text in public or in a noisy environment or space. Some users might wish to appear as if they are just listening to their phone or music tracks on an MP3 player. Privacy is an important issue in tertiary education or whilst working in a quite space such as a classroom where students are practicing private reading or in a library. In a work environment it can be used more without disturbing colleagues. The unit weighs 50g and is 13.5 centimeters in length. It competes very favourably against competing models and brands, as it is half the size and weight of competitors’ offerings. It is comfortable in the user’s hand and accommodates young children (middle primary) through to teenagers and adults. The user must be able to hold and move the pen, with control, across a surface (i.e. a printed page or brochure) in a straight line at about 70-90-degree angle. The C-Pen’s ergonomic design means that it’s very easy to hold and move along a page (or line) of text on a flat surface. The C-Pen can move at a fairly quick pace – or moved slowly at a user’s own pace. It is reputedly more accurate when scanning over a line of text than other competing pens. It comes packaged with a black pouch for storage and safety and an earpiece (as per a mobile phone). If lost, any off-the-shelf model at any price point, can easily replace the earpiece. When you turn on the C-Pen Reaper Pen, (hold and keep holding down on the Power Off/On – Back) button for about 3-4 seconds, and the unit will power up. The C-Pen logo appears. It then graphically displays the amount of charge left in the unit. The user is automatically in the Main Menu. It displays the date and the charge reading as small icons. Users can select a number of options including Text Reader; Dictionary; Scan to a File; Recorder and Settings by using the Up/ Down / Left and Right buttons on the scroll wheel. Central to these functions is the round OK button. When I first experimented and trialed the pen, I chose to explore the Settings first to work out how to configure the device to suit my needs, as well as to determine the options for other users. To move about the menus; the person uses the Off/On Back button and the scroll wheel (with up, down, left and right buttons surrounding the OK button). I scrolled down to the Setting Options using the down button repeatedly (4 presses) and pressed the OK button when I had the Settings option displayed – (i.e. the middle of the scroll wheel has a small square icon on it). In Settings, you can choose a voice in the TTS (Text-to-Speech) option. The user can elect to use a British English or American English voice. The C-Pen Reader male and female British or American English voices are clear and more natural text-to-speech voices than competing pens. This is critical. Each user should be able to clearly understand the words and hear the pronunciations correctly. Simply scroll down to choose American English and press the OK button or press the up button and press OK for British English voice. It’s that simple. Selection of the remainder of the options will function and operate in a similar manner. If the user decides to opt out, he or she presses the Power Off/On Back button to go back up one or more levels to the starting Menu selections. To turn it off, once again hold down the On/Off Back button for about 3-5 seconds. Therefore it cannot be turned off by mistake or inadvertently. The user can set a ‘read’ delay from ‘none’ to up to 3 seconds. This will accommodate someone who needs to scan some text and then wait until the text is read aloud. They might like to visually scan the text from the source material as the words or data (e.g. numbers) are being read aloud back to him or her. The user may have an auditory processing disorder, an acquired brain injury or it could be a young child who needs time to physically scan the text then have time to process the information using a 1-3 second delay. This is yet another important option to accommodate individual needs. In Settings, the device can be set to operate as either left or right-handed mode. The display simply “switches” to an upside down interface. The operating buttons are now to the right hand side of the user as is the scanning window. Resetting it, just hold the unit in the left hand, scroll to Right-handed and press OK. All the menu item options are that simple to operate and learn. This means a class set (of ten that are available as a separate product) or a single C-Pen can be shared amongst students or colleagues. No need for tech support! It might be siblings who are sharing it with mum or dad. The Brightness can be altered to accommodate the particular space or environment in which the user is working. This will also impact on battery life. Brightness ranges from 0-15 in 5 graduated steps. I opted for 9 (i.e. the third bar along the graphic). Students who may have a visual dysfunction or impairment (short or long term) may need it to be very bright or conversely less bright. The first thing I did when I received the C-Pen was to set the time and date. This is so important as all of the scans and text capturing, is controlled by the internal clock. If it were not correct, I would not know accurately when I captured a particular text. First the user sets the Day, Month and Year and then the time (24 hour clock). An automatic shutdown can be set ranging from 5 to 10, to 30 minutes, to an hour or 2 hours. This will help preserve battery life. I set mine to 10 minutes. In System Information, the State of Charge can be located (shown as a percentage) and Storage Space (it has a total of 4Gb and mine had 1.03Gb free). The Version Information can be viewed and the dictionaries installed and being used. There is also a System Upgrade (that I did not touch!) and a Default Settings where the C-Pen can be put back into a factory setting mode. The Version Information will come in handy if any technical issues arise and the user needs to contact the company or distributor for Tech Support. The system upgrade can be performed at no cost to the user, so that in its life it doesn’t become obsolete. This is the first option in the menu at power on, and the one most likely to be used most of the time, according to the user’s needs. Once the user presses the OK button, a blank screen appears with a flashing cursor. Now the user scans some printed text from left to right or from right to left – using his or her left or right hand (all set up previously and customised in the Settings Menu as well as the delay, brightness and voice). Once positioned just before the text and gently but firmly pressed down on a flat surface, a light appears in the scanning window. The user is now ready to move the pen across the required text. I found that I could move it quite quickly and it operated seamlessly. The text that was scanned appears in up to three lines of bright blue text on a black background in the C-Pen’s window. After any delay, the words or data (e.g. numbers) are read aloud in the English or American Voice (or Spanish if that is the current language being used). Each word is highlighted as it is spoken back. The text can be repeated as a whole or as individual words by using the up /down/left/right arrows and OK button. The text can be read back repeatedly at will. It’s that easy. To continue, the user selects the next line of text and repeats the process. The new text will replace the old in the window and will be read aloud. The user continues as she or he desires. All text captured remains in the C-Pen until it is erased (purposefully). The users can append files and continue on from a previous class, lesson, session or study/reading session. There is an Adding mode if you switch the unit off and turn it back on again. The unit is ready to scan once more as it turns on in the same state as when it was turned off. From Listen Settings option, the user can elect to append text or replace it. Scan languages can be changed from this menu as well. In Scan Languages, the user can select from English or Spanish. In Reading Settings, the Speed can be altered (i.e. the rate of speech) from three settings from slow to fast (I chose the middle speed). The Volume can be set from one to five bars. The loudest voice setting playback is quite loud and would suffice even in a busy environment such as a classroom or work area. In the workplace or in a supermarket where a person wants to be discrete, it might be turned down to the first setting (or the earpiece used). It is so portable, it is an ideal tool for people to use in the community when they are shopping and checking labels on boxes or cartons for ingredients or potential dangers as presence of nuts (for people or children with allergic reactions). Individual words can be selected and scanned as well. This will prove useful to identify words, read difficult words from a passage of text, and learn a new word from a book or handout or to check words for how they are pronounced. I chose the British English option for my voice as I consider the pronunciation more useful to me as an Australian as the American English voice. The modeling of the pronunciation is another side benefit for some users, especially with difficult, long and unusual words. I chose the English to English and the Oxford dictionary. The user scans a word and it is read aloud. If the OK button is pressed, a full definition is read aloud. It is very comprehensive! The playback of the definition can be stopped or cancelled by pressing the Back button. In Dictionary Settings (by pressing the Menu button) the History can be displayed. By scrolling down with the left button, all of the previous words that have been selected for definition are displayed one at a time. This rich history would be ideal in a classroom where the support person can discuss with the teacher/trainer/tutor the words that the client or student had difficulty identifying. Each word can be selected and definitions read aloud again as a refresher and/or for assessment at the end of a class or session. They may be made into a practical spelling quiz or for further analysis and practice. In Reading Settings, the Read OK can be turned off or on as can Read Scan and Read Definition. Some users might not require or need the definition read back (especially for younger children or those with special needs) as it may not be relevant or too advanced. [Note: Read definition is only available in the English to English setting]. When the user selects Scan to File, he or she may start a New File, open an existing file (i.e. Open File) Delete File or choose Scan Settings. In Scan Settings, Scan Languages and Reading Settings are once again available for altering or changing. This seemingly double up of menu options is made available as the user may be dynamically scanning for one purpose (i.e. scanning to read some text or read a label or text from a map) whereas when the user is scanning to a file, the person may wish to change some of his or her settings. Scan to file allows the user to scan entire paragraphs or pages of a book, novel, newspaper or journal article (be aware of copyright restrictions). These files can be voiced aloud at any time with or without the text in front of the user (e.g. for practising reading or rehearsing the lines of a play or script). They can also be transferred to a computer (MS Windows, Mac OS or Linux) using the packaged USB cable. As an exercise, I went to s Spanish website. I then copied some Spanish text, pasted it into a MS Word document and then printed it in 13-point size font. I then used the C-Pen to scan the text one line at a time, at a fairly fast rate from my printout. It read aloud the Spanish words to me one by one at the speech rate that I had set, in Spanish, with all words highlighted. My next option was to listen to the finished file (i.e. all text captured) or parts of it. I later transferred the file to my computer. For anyone learning to speak and write Spanish, this is another great bonus! Spanish is the second most commonly spoken language in the world – Chinese first with English at third. A very useful feature is the Voice Memo tool. The reading pen has a Dictaphone built in. It allows users to record audio and voice memos – or even music or sound effects made by the user. These files are saved to the device and can be listened to or uploaded to a user’s computer at any time. A support person might use it to give instructions to the user for a reading or study session. Or they could provide memos or feedback regarding text selection, content or attributes. Users can add voice annotations to sections of a book that they are studying or responding to for class work. The Dictaphone can also be used to save ‘to-do’ messages that may be forgotten if not written down (especially if the user struggles with spelling and writing and has organisational issues). From the Recorder Menu, the user can choose from Record, Play Recording, Erase Recording, Play Music, and File Format. Music or Dictaphone recordings can be saved as MP3 or the larger WAV file formats). The Sound Quality can be set to High (more memory used) or Middle or Low (i.e. less memory used but not replayed at a high quality of sound recording/playback). Once the user sets the parameters, and the user selects Record, the interface displays the file format (in my instance MP3) the quality of sound recording (in my instance low) and indicates Press OK to Record. The user presses Record and it starts recording. In the C-Pen’s window are REC(OK to Pause) and the number of seconds being recorded in the time 00:44 format. When the user presses OK it pauses, when the user presses OK it continues recording (in the same file). To stop recording, the user presses the Back button. A file number is displayed as the recorded piece of work, or study, or commentary, advice, directions, instructions, narration or music. This is a very useful, practical and handy feature as it compliments the reading and research properties of the C-Pen technology when employed as a reader and recorder of information, data, numbers or language. In Play Recording, each file is displayed (e.g. 170529) and the length in minutes and seconds. Notice that 170529 was the 29th May 2017. The next file was appended with a ‘_1’ (i.e. 170529_1). The user can keep track of files saved by the date and number of recordings on that day. There is no need to enter or remember file names. In Erase Recording, the user moves the arrows to the intended file(s) and erases them. A warning of “Are you sure to delete it?” appears before the user press Yes to confirm or No to change his or her mind. The C-Pen Reader is Mac OS, MS Windows and Linux compatible. There is no software required when used as a keyboard or for transferring files to and from the C-Pen. All the functionality and features are built-in. Another bonus is that there are no further consumable costs as the battery is charged via a USB cable. No messy battery swaps or losing them – just when work has to be completed. When users connect the pen to their computer via the USB cable it appears as an external hard drive (i.e. similar to a thumb or USB drive). Users can scan pieces of text, store their files in the pen’s memory and transfer them later to their computer(s) or submit their research and data to a trainer or teacher. This is an extremely useful feature if users are in secondary/ high school or are studying as a university student or researcher. No software is required and it can be performed on anyone’s computer. The C-Pen Reader also doubles up as a USB drive with 1GB of data space available. The software’s intelligence, voices and dictionaries take up 3GBs. The remaining 1GB can be used over and over again by recording text or audio and then transferring it to a computer or erasing it. That’s well over 1 million characters of text. Or music files can be stored and played back as a leisure or study option (e.g. an actor reading part of a play or passages of verse than needs to be practised). After connecting the C-Pen to a computer, it prompts the user to select Keyboard, U-Disk or Charging. In Keyboard Mode, once the text is scanned it is sent directly into ANY text-based application as if the user was typing it. No special software or drivers are required – it works straight out of the box. Whilst the text is being transferred from the document, page, book, journal, handout (or a text or book that may not be available for loan from a library), the unit is also charging. Make sure that the computer keyboard setting on the computer is set to English, Australian or American English. If Spanish text is being scanned, then set the computer keyboard must be set to Spanish. This mode is exceptionally useful for students who can’t read. The support person at school, or siblings or parents can scan chapters of a novel that the student needs to study. The text is ‘typed’ by scanning one line at a time and “flooded” into a program such as Microsoft Word or Pages etc. Any errors or omissions can be edited and the file saved. They then can have it read aloud again! The student may elect to have the ‘book’ transferred to a more amenable mode for study using TTS (text-to-speech) on their computer. Free programs such as Balabolka or DSpeech can be used for this purpose as they have speech feedback and voices built in (and they are free to download for MS Windows computers and Notebooks.). 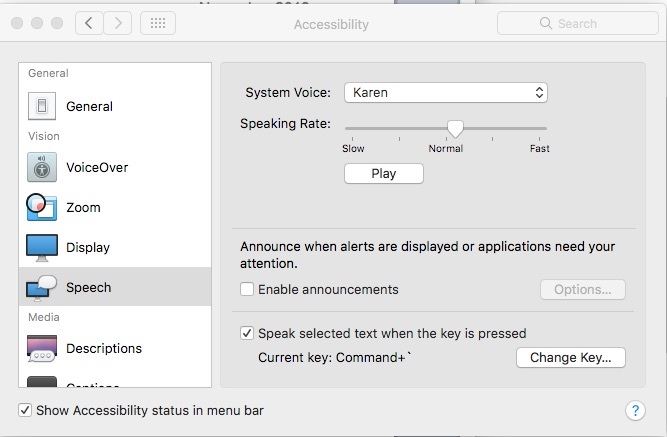 On the Mac, simply use the embedded TTS speech option (Apple Menu/ System Preferences / Diction and Speech/ Text to Speech). The user can elect to choose a voice and decide the two keys to press to have any selected text spoken aloud. Note: Other free human quality Mac voices can be downloaded and installed on a Mac computer at any time – at no cost. 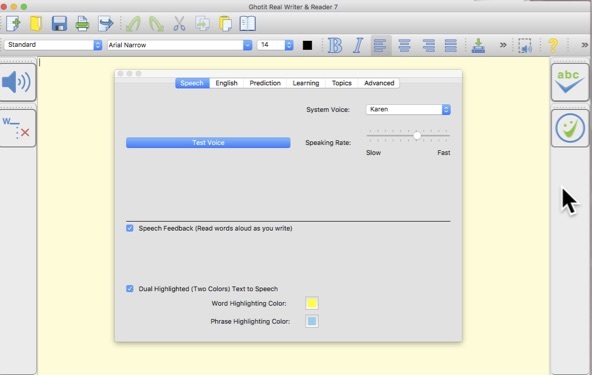 If you are a Mac user and rely on good quality speech feedback, click on the link provided (i.e. voices) and explore the many different voices on offer – including languages other than English for users’ own personal use. The English based voices (e.g. American, UK English etc) may be fun to explore. The Spanish voice may be important and handy, too. In U-disk Mode, the C-Pen connects as a USB disk. The user can upload or download and manage their files and thus control storage of the pen. When charging, the C-Pen is just doing that function. No data is being sent or managed. As there are no batteries, this is a cost neutral option for users. The C-Pen Reader represents a very natural and easy to use, convenient text scanning and TTS tool to capture printed information (text, numbers, codes, etc. ), decode it instantly (using OCR) and speak it aloud. Then if required, transferred to computers for further study, research or practice. With C-Pen, as opposed to flat bed document scanners, it is portable and hand held. 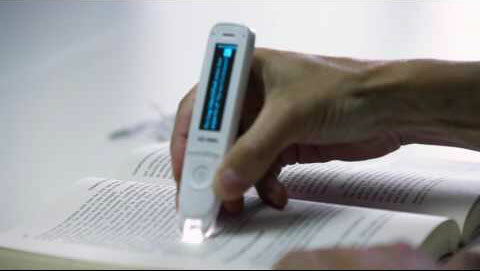 Fundamentally, it is a pen – with a scanner using accurate OCR technology built in. The text or numbers of interest are selected and easily extracted and captured for short or long-term use. The option for further processing (i.e. text-to-speech, translation using other software, for study and research or for general data entry, etc.) can be achieved instantly and without any further manual interaction. The user just needs to capture the text by physically moving the pen across printed text that is on a level surface. Users can opt to have it read back to them immediately (i.e. the norm) or stored and transferred via a USB cable (provided) to their MS Windows, MAC OS or Linux computer. Text can be used in MS Word, Pages, spreadsheets, and book creation programs, PowerPoint, OneNote or straight to blogs, wikis, Google Docs and to other web pages. If the client has Read & Write Gold, Ghotit-Real Reader and Writer, ClaroRead or other literacy support tools, they can append the text, answer questions that were scanned or correct any errors whilst scanning (e.g. missing a word at the end of a line). It can also be used as a dictionary. Users can isolate and choose uncommon words, words that are new to them or difficult words that they don’t identify (due to poor spelling and reading skills). The word that has been scanned by the pen is read aloud as is the definition. C-Pen is empowering as it provides a tool for total independence. As long as a user can physically hold the pen and move it across a surface (e.g. a novel) at a 70-90 degree angle, with a steady hand, they can read. Anything. The only real disadvantage for younger children is that it only accommodates text that is 22 points high (i.e. about .75 centimeter). Many children’s books use large fonts so it would not be useful with Big Books or literature that has fonts larger than 22 points. Users who are partly deaf or who have difficulty using the earpiece may not find the pen useful – but it might be worth trying. Author: I’d love to see future C-Pen Readers with Bluetooth capability where the text can be sent to Bluetooth enabled devices (such as the newer hearing aids on the market for deaf students) or to Bluetooth enabled speakers or devices (e.g. mobile phones). I’d also like a small handle on the pen or the black carry pouch for a lanyard to be connected for safe movement between classes or to remind the student to use it! Carrying it around the user’s neck might be safer than in a pocket, pencil case, purse or rattling about in a school bag. In the past, the first generations of pens (as there are competing models and brands on the market) have been large, heavy or clumsy. The C-Pen fits very comfortably in the user’s hand – just like a normal pen. And for students who don’t like technology, it isn’t geeky as it looks just like a pen! If a person can’t read, the C-Pen is extremely liberating as they can independently function with printed text wherever and whenever they require it with this portable, discreet tool. Editor’s Note: This product review of for the C-Pen Reader was written and composed in May 2017, using a Mac desktop running Mac OS 10.12.5 Sierra. 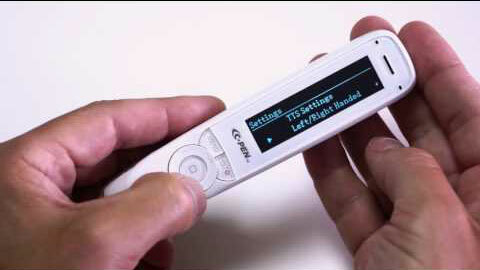 The C-Pen is a standalone device; Dictaphone as well as a keyboard scanner and USB drive. It will work with MS Windows, Mac OS and Linux computers, notebooks, tablets and desktops. A user manual is provided but a handy online document may prove to be very useful – User Manual. It has a twelve-month user warranty against any defects (not user damage or abuse). Note: All images in this review are copyright to the Reader Pen Company. There is another product, the C-Pen Reader Class Pack (10 pens). This product comprises of 10 C-Pens Readers, 10 headsets and 10 USB cables all packaged in a smart attaché case. This brief case is designed for easy storage and safety when transporting around the classroom/ school/ TAFE/ University/ workplace/ Training Institute/ library or other premises. Another product (not reviewed) is the C-Pen Exam Reader pen scanner. It is major technological breakthrough for anyone wanting to read English exam questions. 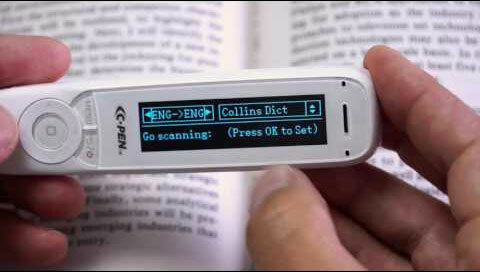 The C-Pen Exam Reader is a totally portable, pocket-sized device that reads text out aloud with an English human-like digital voice. The Exam Reader has been approved by the Joint Council for Qualifications (JCQ) for use in exams in the UK (the pen having no dictionary or thesaurus, nor on-board data storage facility). This means students who have reading difficulties such as dyslexia can independently take exams knowing that they can read and understand the questions. No special access arrangements are required. This is sold as a separate product. I wish that were the case here in some states of Australia! Ghotit "Real Writer and Reader" V5 is the latest version of this simple to use and master, yet very powerful literacy support tool. Separate versions for MS Windows and Apple Mac are available. Ghotit Real Writer and Reader, now at Version 5, is a very comprehensive reading and writing assistance solution for users with dyslexia and/or dysgraphia, for those struggling with creating or reading text or for students with English as a second language (ESL). It caters to a diverse range of users from middle primary students through to teenagers and adults, as it is so easy to use. This latest version does not require active connection to the Internet. Once installed and configured (which does require Internet access as a one-off event) it is a standalone program that can be run in a resizable or full window. Once configured to meet a user’s specific reading and writing needs, there are only four major onscreen "buttons" from which to choose. The clean, uncluttered interface will appeal to users who become confused and frustrated with messy or ‘busy’ toolbars. Ghotit-5 is a powerful English spelling and grammar checker for users with dyslexia, dysgraphia and assists students and adults with other reading and writing difficulties. By using the software, it has been have proven to dramatically improve users’ writing and reading capabilities. Text creation can prove difficult for many people, in education, in training and in the workplace. Even writing emails or posting up comments to social media sites can be embarrassing and off-putting. Ghotit Real Writer & Reader assists struggling readers and writers so that they may improve their reading and writing skills. It will alleviate the tension and worry that may cause them to avoid or fail whilst handling text. Ghotit promotes confidence and caters to both students and adults alike. They are more likely to cope and thrive with their reading and writing work assignments at home, at school in training and in the work place. Reading and writing can be enjoyable instead of a challenge! Ghotit Real Writer & Reader software provides good value for families as it caters to a wide audience, starting from students in primary school, in secondary or high school, and into higher education as well as for mum and dad to meet work and social needs. Employees who need to read and write as part of their work responsibilities can dramatically improve their working efficiencies. As it will operate with any other program or web browser, it will enhance skills in dealing with their own personal writing as well as dealing with third party text (i.e. from other sources such as online books, articles, Word files, PDFs, emails and social media and other writing and literacy programs). It is a powerful tool for users with dyslexia or for struggling writers as it tackles many of the common problems that users encounter whilst writing. This includes difficulties with reading, writing, spelling, proofing and accessing documents and text in different formats. The interface strips out annoying or distracting photos, drawings, maps, and other graphics that may distract or confuse the writer. It includes patented technology that provides the most appropriate corrections for spelling, grammar and punctuation mistakes by looking at the intended meaning of the piece of text. The software has matured since earlier versions, whereby it relied on the Internet to provide this outcome and intelligence. This latest version 5 is standalone and does not require access to the Internet. Everything is built-in and ready to go after the initial installation and configuration. In Preferences, users, educators, parents and tutors can adjust and change every aspect of the software so as to cater to individual needs. It has so many empowering benefits and options. Universal Design for Learning principles are adhered to and therefore it accommodates practically everyone. Universal Design for Learning (UDL) is a framework designed to give all students equal access to learning. It underlies the Multiple Means of Representation, by providing ideas and strategies to use when delivering content to a variety of learners. Of course, users can operate Ghotit with any web browser of their choosing and cut and paste text from a web source and paste it into Ghotit’s window. They can then listen to text being spoken aloud in a voice of their choosing, and at a set rate (or pace). ‘In the world of spell checking, the degree of how badly a word is misspelled is measured by the editing distance of the misspelled word, to the intended word. The trade-off is as follows: the longer the editing distance, the longer the list of candidate words that will be offered. Since ordinary spell checkers cannot properly grade the long list of alternatives, this long list is seen as adding "noise" to the spell-checking algorithm. Ordinary spell checkers are tuned for people with mild spelling and typing mistakes and therefore prefer to offer a relatively short editing distance, in order to minimise the list of candidate words. Here context spell checking algorithms come to play. Once an effective context spell checking is introduced, a larger editing distance can be introduced, since the spell checker can leverage the context of the sentence to optimise the suggested word list and remove the unwanted, out-of-context words. In Preferences, users can determine the functions and features that they require or need in order to handle text. Preferences include Speech, English, Prediction, Learning, Topics and Advanced. In Speech, a system wide voice can be selected from a variety of Mac based or other commercial voices installed on the host’s computer. Note: Other free human quality Mac voices can be downloaded and installed on a Mac computer at any time – at no cost. 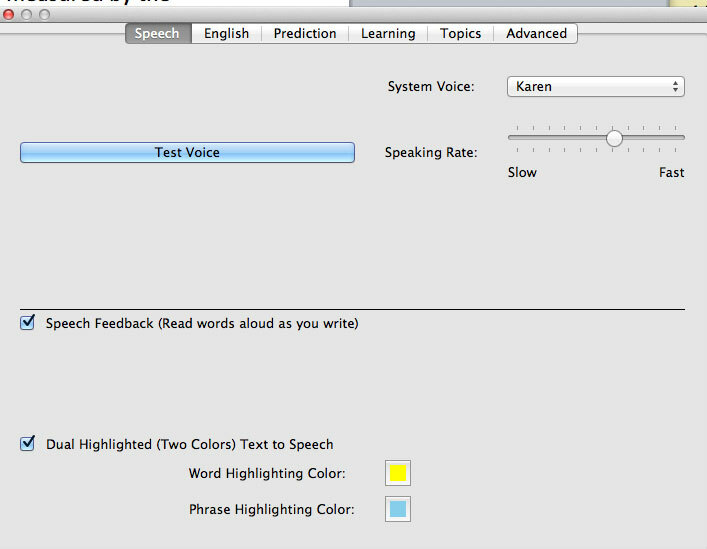 If you are a Mac user and rely on good quality speech feedback, click on the link provided (i.e. voices) and explore the many different voices on offer – including languages other than English for users’ own personal use. The English based voices (e.g. American, UK English etc) may be fun to explore. The speaking rate will accommodate the user’s ability to listen to text being read aloud (as he or she types – i.e. speech feedback) or in reading text from within the Ghotit software window. Some users prefer a slower rate with other users working at a very fast rate. Everyone’s different! Dual highlight colours can be selected to assist in quickly and easily identifying new or unique words with both word and phrase highlighting colours. This is so important for people with Meares Irlen Syndrome. In English, users can select from Australian, New Zealand, Canadian, South African, UK or US English. The descriptions window can be displayed as a stand-alone window and can be muted if so desired (i.e. speech turned off). In the Personal Dictionary, individual words can be added (errors or words that have been added by mistake by the user can be deleted). Words that are difficult to read or identify, are new or foreign to the user can be spoken aloud. This is very important as users may wish to add unique words relevant or pertinent to their area of study, training or workplace. They might also include difficult words or friend’s names or favourite locations such as cities, countries or street names. They can be added or deleted at any time by a support staff member (for students with special learning needs) or by the users themselves. This is a very necessary and vital option as it provides for full customization of the software. In Learning, there is an option for a list of words to be imported from a text file (e.g. words required in rehearsing a script or play or selected text being studied, words from particular study areas, Proper nouns or names of places, people/characters, or locations). Users or support staff can assign these words to a topic and also create their own topic dictionaries. The words on each topic are displayed in a window and each one can be read aloud. Words can also be learnt from a Ghotit document. This function saves a great deal of time in classrooms where multiple students require the same list of new or unique words that aren’t already included in the software. Topic dictionaries cater to all students, workplaces and professions and cater to individual as well as group needs. The user or teacher, school support personnel, tutor, trainer can add topics at any time. Users can add and load new topics when and if required as well as unload them. 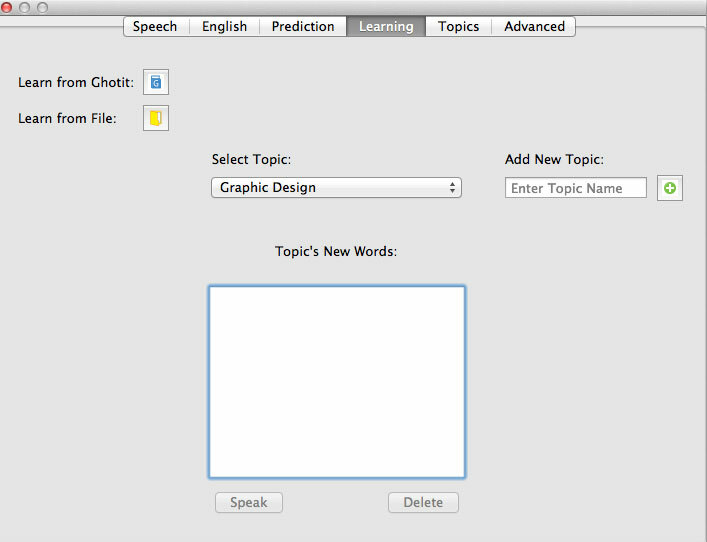 The topics-in-use is displayed in the Topics dialogue box. This is where users create and manipulate topics. Users can have multiple topics active so that Ghotit accommodates their current study or writing/reading requirements. It is especially useful in high school or tertiary education at TAFE or University or in a workplace with very specific or unique word usage. It also caters to programmers – who are often dyslexic! Prediction, or word prediction, can be run in a standalone window or next to the text being entered. Words can be spoken aloud before or after being entered into the document (or muted). Users can elect to have one to up to eight words displayed. Users can elect to have phonetic or creative spelling turned on or off. A space can be entered automatically after a word is selected by use of Function keys (F1 to F8) or by left clicking on it. Predict Ahead is for more advanced users (usually) as it will promote words to the user in context with their writing. It can confuse younger users and students as it can often distract them. For others, it’s a blessing! It attempts to predict the next meaningful word (as per current mobile phones). Word prediction is a complete rework from previous versions. It is using Quick Spell algorithms, so as to ensure all predictions, particularly for users who attempt to write with the first misspelled letter(s), essentially based on phonetic reconstruction and context. Many struggling writers suffer from this inadequacy. If a user writes "Help me to andesa" with 3 errors (first 'a' for 'u', a missed 'r", with an extra 'a') – he/she is provided with the correct word option "understand" as the most likely outcome and therefore the correct option. Ghotit’s very intuitive and clever technology allows for writers using word-prediction to misspell some letters – then continue to try and add more letters and in most cases the correct or most relevant suggestion will be offered in the prediction dialogue box. This is powerful technology. Prediction technology is not new but having this quality of support is not the norm or standard in some other competing literacy support software. The developers have incorporated this intelligence after years of research and data gathering. Users will benefit greatly from this innovation. The Advanced dialogue box provides a number of additional custom tools. Users can set a default font and style (e.g. Arial Narrow 24) so that every time the software is launched, the necessary or required font is ready. This caters to younger users as well as to users who are vision impaired. The text background colour as well as spelling colours can be selected. Users can reset the program to a default layout if they prefer (particularly if a computer is being shared at school or in the home with other users). An encrypted connection can be turned on or off. On screen are two "buttons" – one for correction the other for having text spoken aloud. These can be assigned to one of the function keys (especially if the function keys conflict with other programs being used). Some users (particularly students who rely on the keyboard due to visual or physical needs) prefer to use keyboard short cuts rather than rely on mouse clicks. For users using eye gaze, they would prefer to access the onscreen buttons. This is the beauty of adhering to best practice and incorporating Universal Design for Learning as the software caters to a diverse and wide range of users’ needs and requirements. Access to the program can be via a conventional USB keyboard, Bluetooth models, mini keyboards, enlarged keyboards or programmable models (e.g. IntelliKeys was once very popular), onscreen virtual keyboards, mouse, trackball, joysticks and/or eye gaze technologies. As an AT consultant and as a teacher, I enjoy using this software and recommend it highly as it is so user friendly. The interface (i.e. look and feel) is uncluttered. The four major tools or "buttons" onscreen are available for quick reference, access and use. Located top left of the program’s window is the Read Aloud option. It will voice or speak every sentence or phrase (with a different colour background if required) so that users can ‘track’ the text being spoken back to them, at a rate (i.e. speed) that they can predetermine and set or change at any time. Different voices can be selected for different genres or types of text. Some users prefer the more robotic synthetic voices whilst others prefer Karen or Lee (Australian voices) or other human quality voices that are more natural and have inflection and nuance. Word Prediction can be turned on (enabled) or turned off with the button below the Read Aloud button. Both word and its meaning can be spoken aloud for poor readers or users unfamiliar with the English language. It can also help to build vocabulary strength and improve performance. The Correct Text button is located top right hand corner. It is denoted with a Tick and ABC icon. When clicked or selected (by Function key, mouse click or eye gaze) it will analyse the text and edit it. Any word(s) that do not seem to be correct are underlined with a red colour. Grammar errors are underlined in blue. Users can then proceed to edit each word at their own pace and comfort. Once a word is clicked upon or selected, a dialogue box appears. A list of the most likely words will appear each with a definition. Words can be selected according to need/preference/suitability or ignored. New words can be added to the dictionary as well. Words that are correctly spelled but incorrectly used (e.g. done for did) are underlined in blue. The grammar check and spell-check are generated and work together. Both functions are performed at the same time and do not require access to the Internet (as per previous versions of this software). Approve and Apply Corrections button appears below the Correct Text button. It finalises the writing or text entry process and learns from the user’s style and use of spelling and grammar. There is also support for Split and merged words: Ghotit makes sure that users do not mistakenly split or merge words incorrectly. 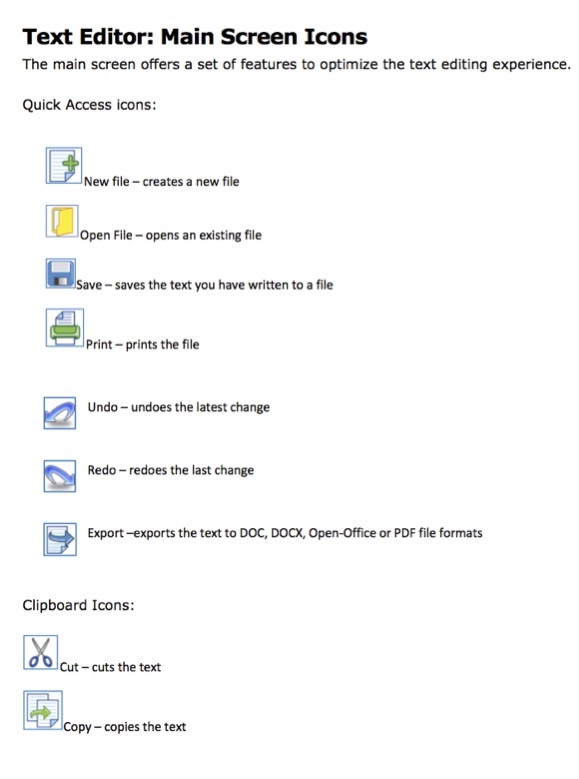 From left to right, the onscreen toolbar includes New File, Open File (text or HTML), Save (text or HTML), Export File (to Doc, DocX, ODT, PDF or RTF), Undo, Redo, Cut, Copy, Paste, and Descriptions. Most of these functions are standard in most text editing or word processing programs. Descriptions is a powerful option. The user selects or mouse clicks on a word. 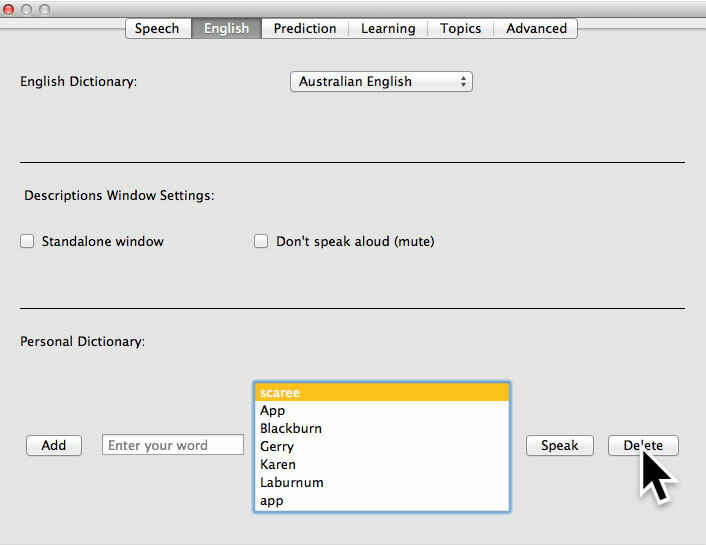 A floating dialogue box appears with the selected word and a description in the chosen version of English (I chose Australian English for this software review). If a word is not properly selected a spoken dialogue box appears instructing the user as to how to perform this function. In the second row in the Toolbar are functions normally used in text editing programs. They include standard text as well as bulleted text (3 options of graphic), Ordered List (Decimal, Alpha lower and upper case or Roman lower or upper case characters). All system fonts are available in the next drop down dialogue box, followed by size options ranging from 9 point to 288 in size (Note: 72 points equals one inch in height). This is followed by the font Colour, then Boldface and Italics. Text can be left aligned, centred, right aligned or full justification (i.e. text is distributed evenly from left to right). When parts of text (or the whole document is selected), the next function (an icon of books lying horizontally) will add launch the Learning dialogue box. Users can elect to add new words to relevant Topics. The next icon (of books standing up vertically) will launch the Topics dialogue box where a topic can be added or removed. Select Area for Reading Aloud is wonderful. It will read any text from anywhere on the screen in any program or window and voice it. The text will be highlighted in a user selectable colour as well as added to the current Ghotit document. Screen-Shot Reader is mainly due for high-res screens like Retina on the more recent newer Macs or on high-resolution screens of modern Windows laptops and hybrids such as Surface Pro 4. On low-resolution screens, users need to increase the font size (i.e. for double type Ctrl-+ in browsers, so as to provide more pixels for the OCR to work. It provides an option to read text aloud from the screen and is very useful for reading text in images, or locked PDFs and other inaccessible documents. Some users enjoy action and adventure games but cannot read the instructions – as they are graphics’ based. Here is a great solution for increased independence. Multiple options are available for either the Windows or Mac versions of Ghotit "Real Writer and Reader" V5. Single licences are available as well as single and site licences (up to 100 users) as well as site only licences (up to 100 users). Multi Site District licences cater to larger schools or institutes of further learning that have multiple campuses. Editor’s Note: This software review of Ghotit "Real Writer and Reader" for Mac V5.0.1.7 was written and composed in May 2017, using a Mac desktop running Mac OS 10.8.5. It will operate on Mac OS 7 and up to the latest Mac OS V10 operating systems on Mac based desktop and portable computer solutions and models. A separate version will operate on MS Windows based technologies including Notebooks, tablets, laptops and hybrids. Further Note: The Ghotit Company generously provided a copy of Ghotit-5 software to the author for appraisal. For further information, refer to Spectronic’s or to the Ghotit’s website: http://www.ghotit.com. For iPad and iPhone users, there is the Ghotit Dyslexia Keyboard. It is available from the App store. There is also a solution for Android phone users. Ghotit V5 – or ‘I got it right’, has certainly got it completely right in this latest version. It has all of the functionality of a simple text editor, but with a twist (or many). It provides full support for users who normally struggle (and often despise) text creation or reading. Now they can communicate! It is simple and elegant – yet it is fully compliant with all of the necessary tools to both spell and grammar check text as it is being typed or cut/copied from another document, web site or program. The latest additions and functionality have only improved an already excellent product. And now it doesn’t need to have access to the Internet to operate. I recommend it to users who struggle with text – it will change the way users work and consider reading, writing and proof reading – with increased confidence and enjoying success rather than experiencing failure. So many special ed classrooms rely on their collection of easy-tech technologies from AbleNet to actively engage their students in learning. Take advantage of this 20% discounted pricing offer to update your collection of AbleNet technologies before 30th June 2015. Lets students with physical disabilities use this wireless Bluetooth switch to access their favourite apps. Provides single or dual switch access to iDevices running iOS 8 and 7, Apple computers running OS X Mavericks, and all switch accessible apps or software on iOS, OS X, Windows, and Android. A new member in the AbleNet Beamer wireless switch family, the Mini Beamer Wireless Switch combines rechargeable battery, small form factor and proximity sensor activation surface to give you a compact, easy to use, no-wire switching solution. The NEW Relax is an accessible infrared (IR) learning remote that comes with an updated modern design and provides simplified control of almost any IR device. With a light touch or with the use of a switch, an individual can control up to eight functions on their favourite IR device. TV's, music centres, air-conditioning, fans, heaters and more. If it has a remote control, the new Relax will be able to control it. The new Connect Case for iPad unlocks the power of the iPad for users with significant physical disabilities. Connect provides switch accessibility, brilliant sound, and exceptional design to create a one of a kind solution for the iPad. Its sleek outer casing protects against impact making it a valuable addition in all primary school classrooms using iPads with their students! You can ditch the CD! No more CD-wars. No more looking for lost CDs! No mare having to wait for the replacement for your damaged CD to arrive! Includes all 25,000 PCS symbols – including the high-contrast symbols and sexuality symbols (which can be turned on or off as required). No need to buy additional Addendum Collections. And guess what else? When new symbols are created they will just appear in your Boardmaker Online account with new symbols being created every month now! Bringing in other images and photos is so easy. All part of the same search. Search for a symbol, images on your computer or dive out to the web all from the one search dashboard. All of your existing Boardmaker activities can be uploaded and used. No need to re-create them in Boardmaker Online. Whew right? Like seriously … Whew!! And YES! The PODD communication books on CD can be opened in Boardmaker Online. So if you own PODD and have a Boardmaker Online subscription, you can upload the PODD pages to your account and edit and print. And NEW! You can now send your Boardmaker activities to an iPad!! A great way to share activities with students, parents and other colleagues. You don’t have to be online to use the activities created. If you want to use them offline, download them onto your computer hard drive for offline viewing. Track data about how the student is progressing. Viewable by all on your team with a school or organisational subscription. Still print whenever you want. Just as you could with the CD-based version. With the added bonus of being able to print from any computer, anywhere, directly from your web browser. With Organisation-wide subscriptions, instructors can assign activities to multiple students. Students can also be assigned activities from multiple instructors. Can you still buy CD-based versions of Boardmaker? Sure. But with all of the additional benefits above, why not ask Spectronics for a quote for your school or organisation? Boardmaker Online subscriptions ensure that you and your team are fully up-to-date with the latest features and can access all 25,000+ symbols and ready-made activities as soon as they are released! Check out what Amanda Hartmann, Speech Pathologist and self-confessed "Boardmaker addict" has to say about this new online version of the program in her recent blog post titled, "Boardmaker Online – Jump on board!"